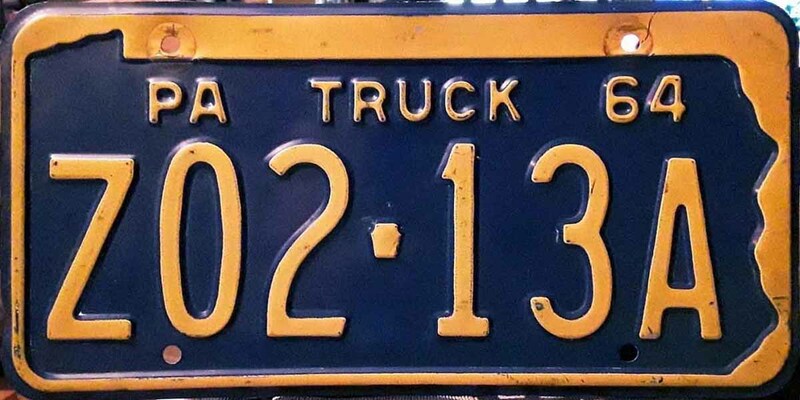 1914, this was the first year for state issued truck plates. 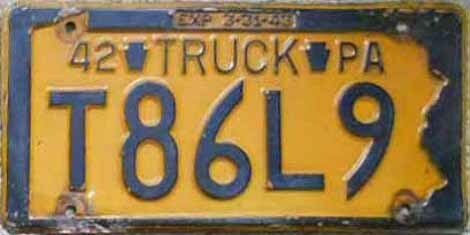 Plates were white on black porcelain. 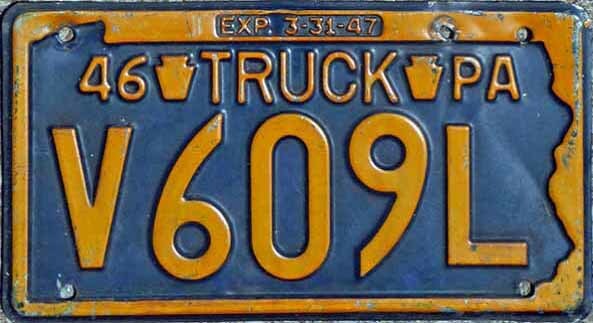 Serial number from 20000 to 39999 were reserved for trucks, and cars with solid rubber tires, but only some 6000 were issued. 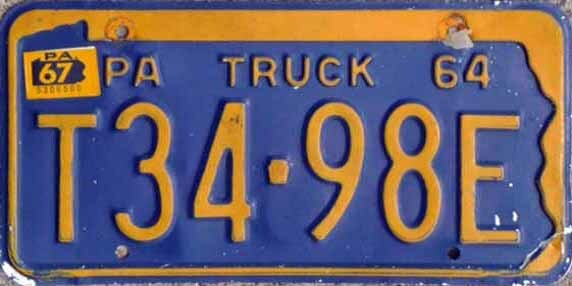 Aluminum weight strip on left with 1 to 5 stars indicating the weight rating. 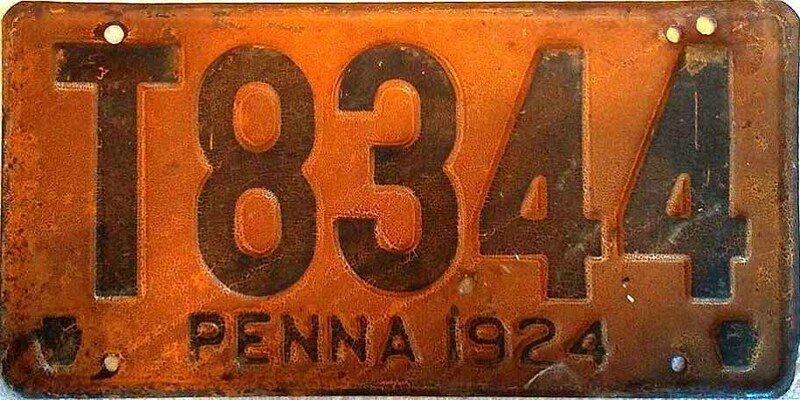 PENNA over the makers number on the aluminum keystone over 1914 on left side of plate. 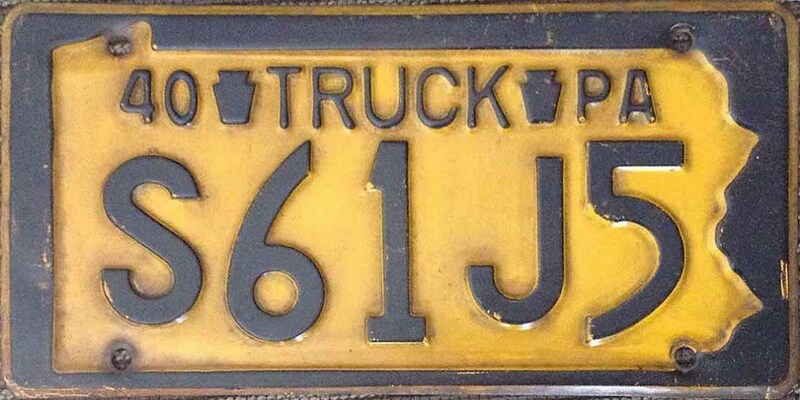 Issued in pairs. 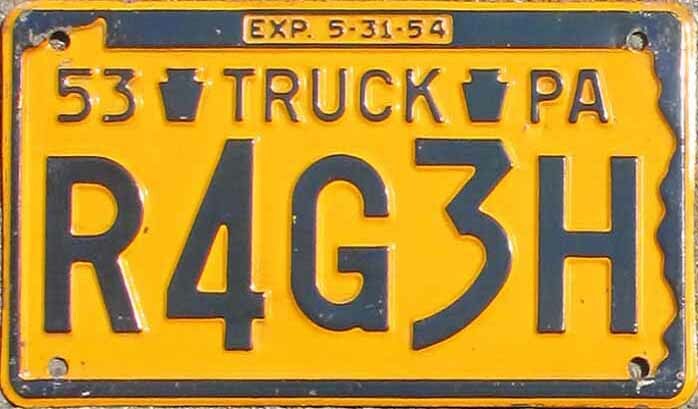 Plate size is 6" by 15¼". 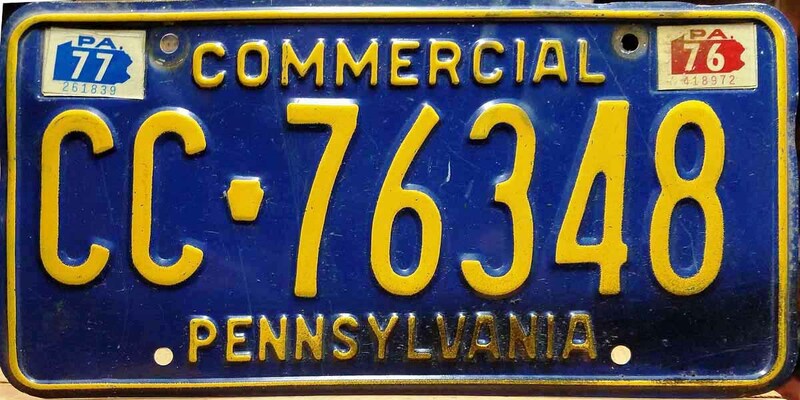 Manufacturer was Brilliant Manufacturing Co., Phila., PA.
Plates were white on sky blue porcelain. 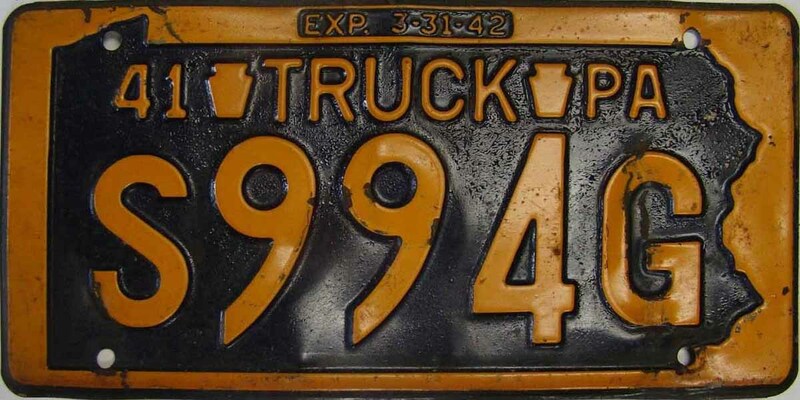 Serial number from 20000 to 29999 were reserved for trucks, and cars with solid rubber tires. 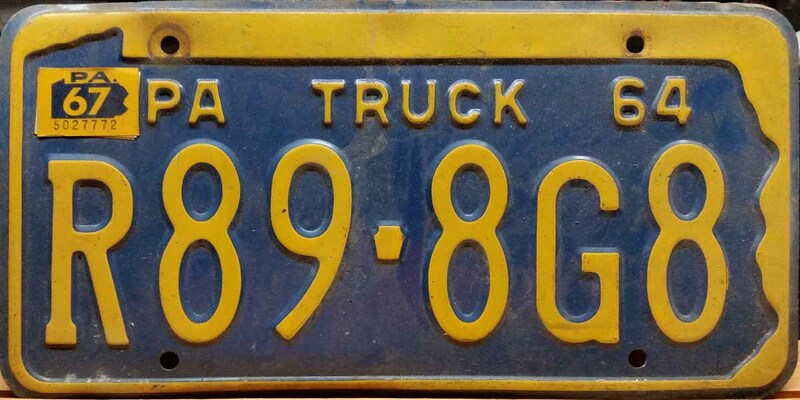 Aluminum weight strip on left with 1 to 5 stars indicating the weight rating. 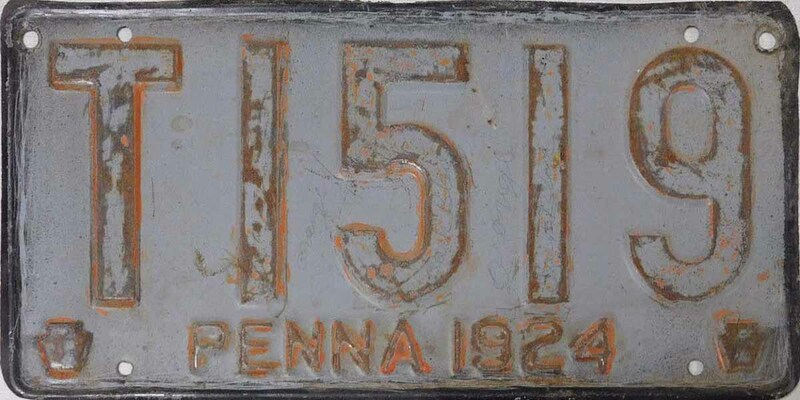 PENNA over the aluminum keystone with the makers number inscribed on the keystone, over 1915 on left side of plate. 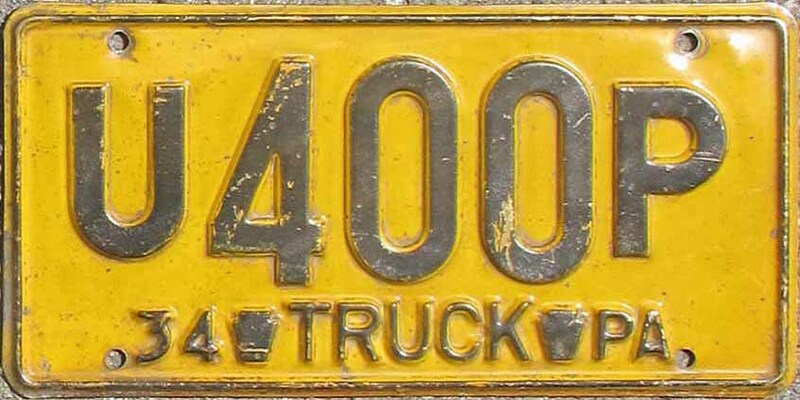 Issued in pairs. 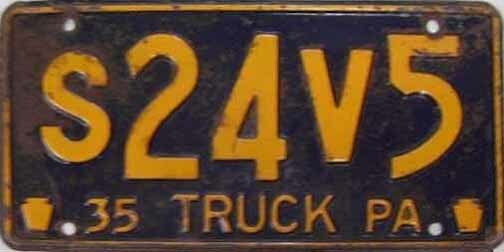 Plate size is 6" by 15¼". 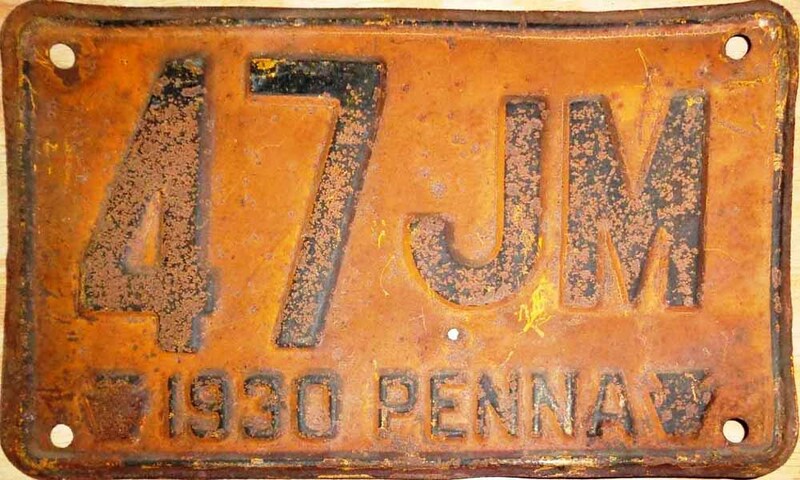 Manufacturer was Brilliant Manufacturing Co., Phila., PA.
Plates were black on orange painted steel. 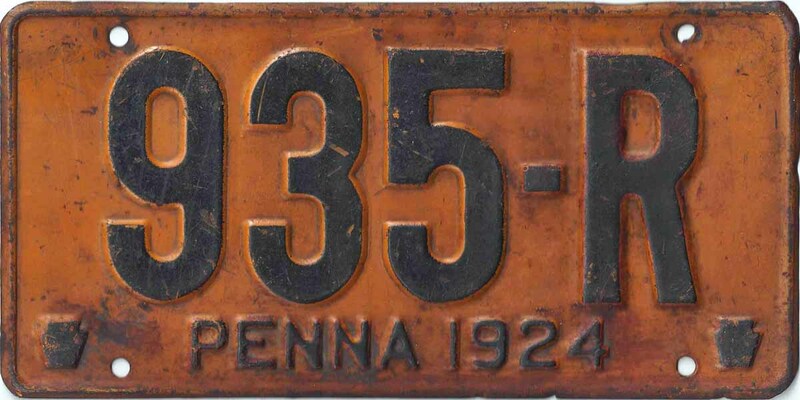 To the left side of the serial number PENNA embossed over embossed keystone. 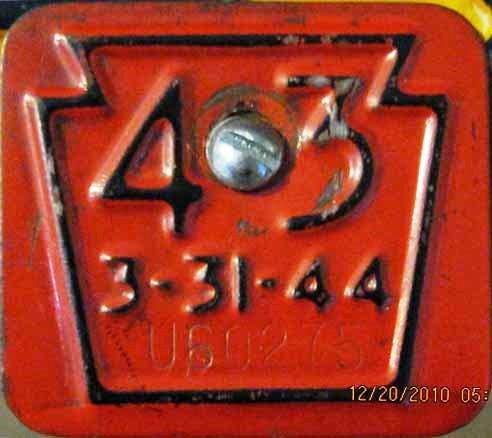 Maker's number was stamped into the keystone. 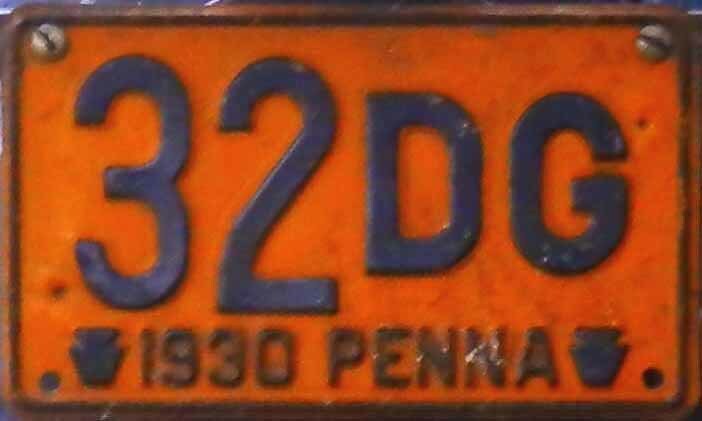 1916 embossed below keystone. 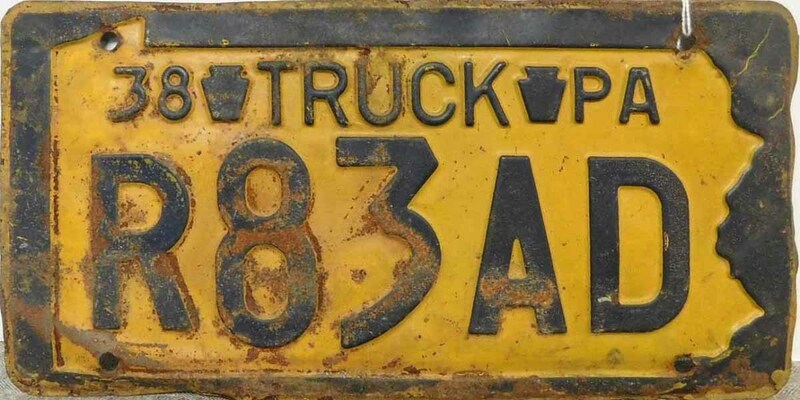 An aluminum keystone was only used if the plate was transferred to another vehicle. On the far left were 1 to 5 stars arranged vertically indicating the weight rating. 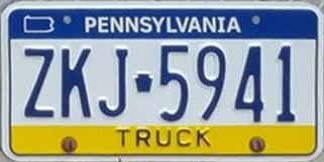 Issued in pairs. Manufacturer was Brilliant Manufacturing Co., Phila., PA. 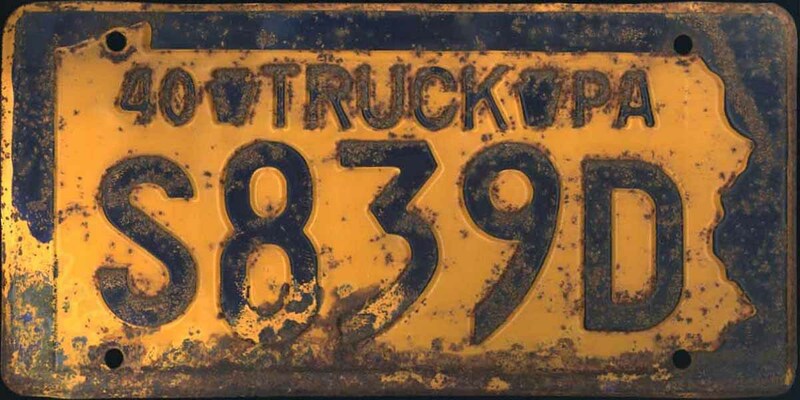 It appears that truck and solid rubber tire vehicles plates were generally in the 20000 to 29999 range, however, truck plates outside of this series are known. Nominal measurements are considered 6" by 16", actual measurement is 6⅛" by 16⅛". 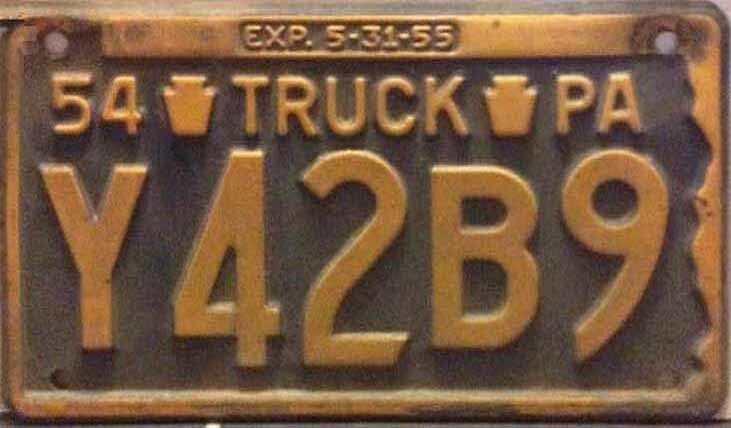 Plates were white on brown painted steel. 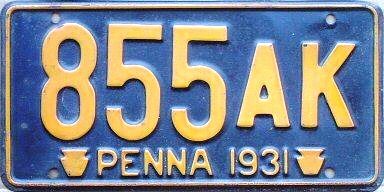 To the left side of the serial number PENNA or PA embossed over embossed keystone. 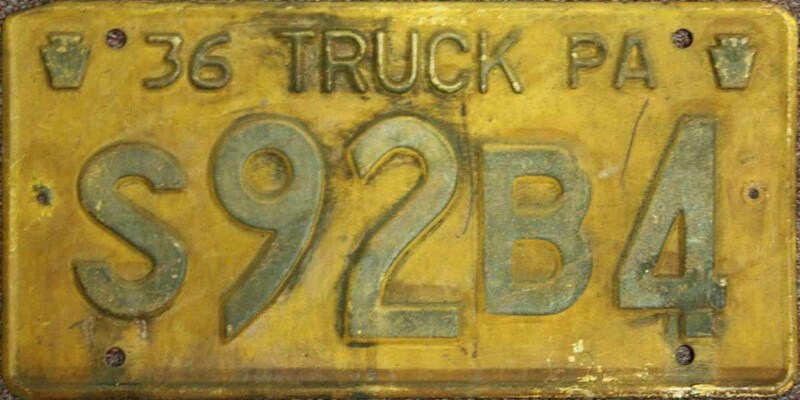 Maker's number was stamped into the keystone. 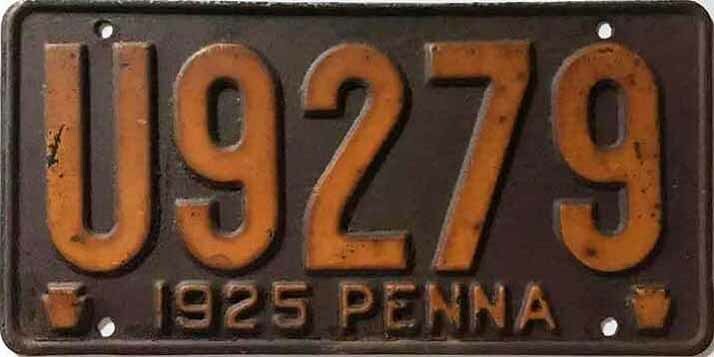 1917 or 17 embossed below keystone. 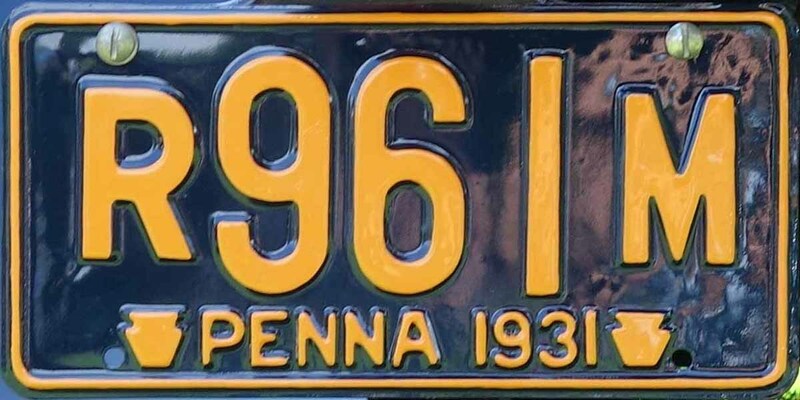 PENNA & 1917 were used on lower number plates, while PA & 17 were used on higher plates. 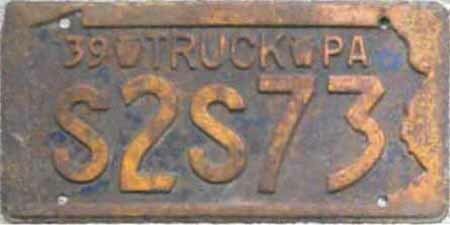 An aluminum keystone was only used if the plate was transferred to another vehicle. 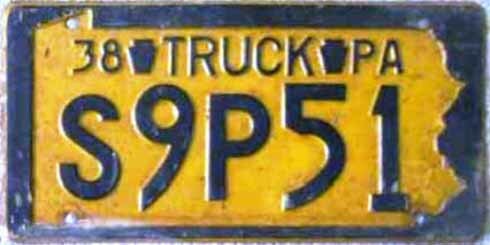 The S-prefix stood for solid-tired motor vehicle. Weight classes were listed as: First Class to Fifth Class as described below. 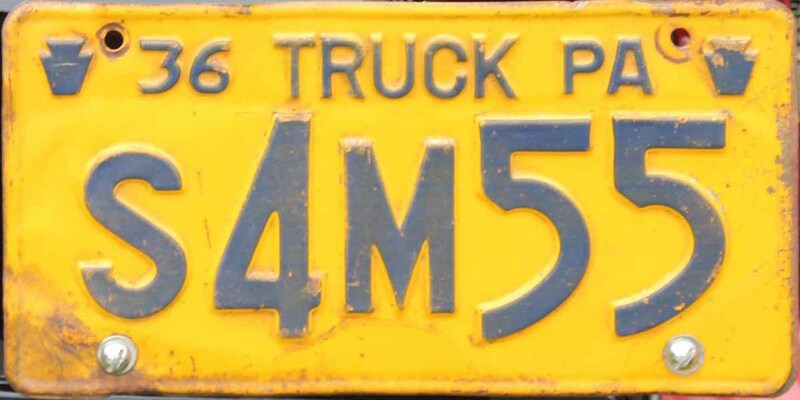 On the far left were 1 to 5 stars arranged vertically indicating the weight rating. 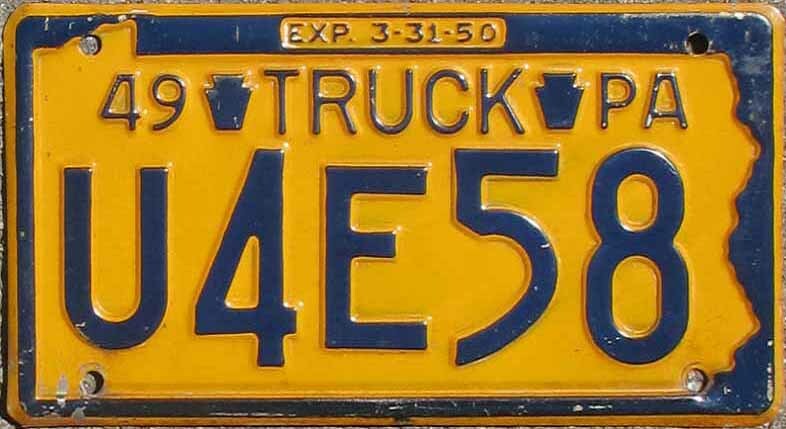 Issued in pairs. 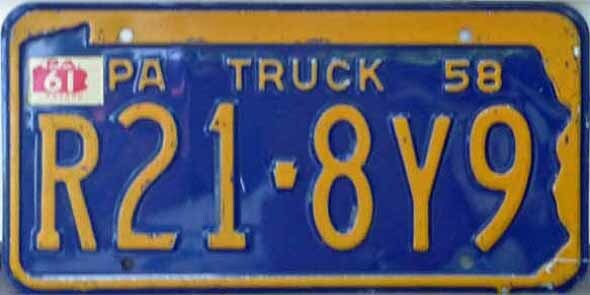 Plates were made in state prison system. 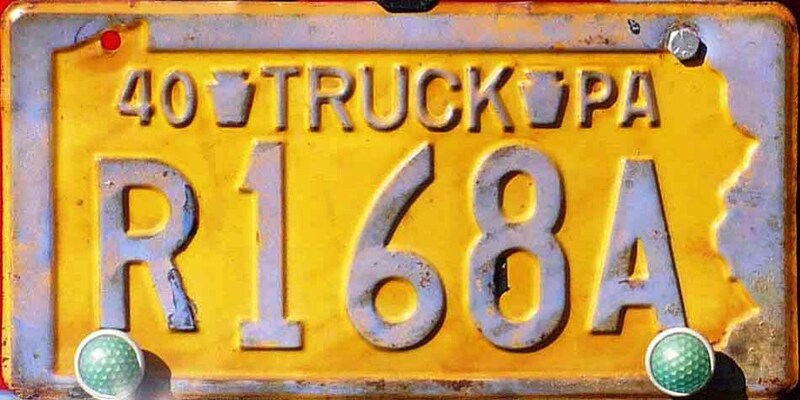 Nominal measurements are considered 6" by 14" and 6" by 16", actual measurement of the larger plate is 6⅛" by 16⅛". Measurements of the size referred to as 6" by 14" need to be verified. 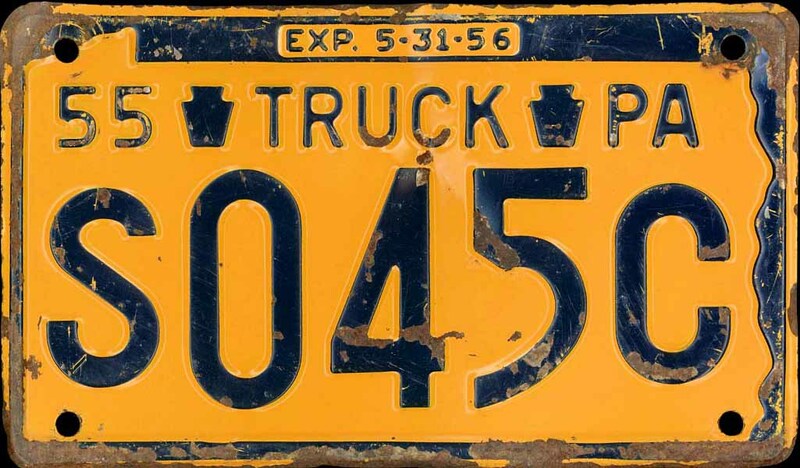 Not all class blocks were issued in their entirety, and not all stars and serial numbers were issued uniformly. If classes ran out of numbers some additional groupings were established. 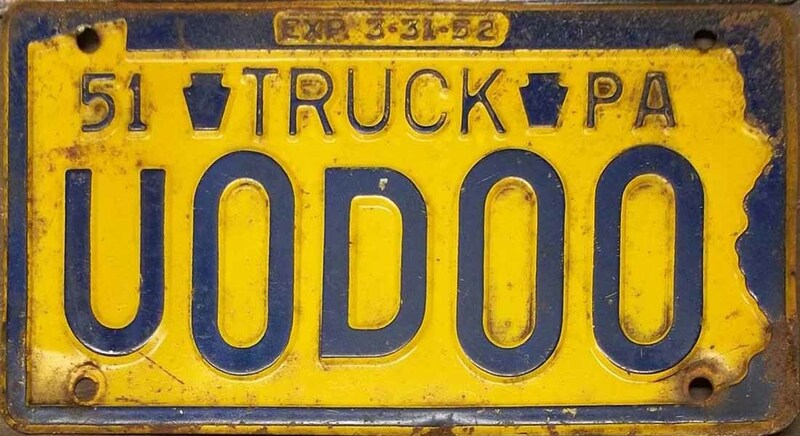 Plates were white on black painted steel. 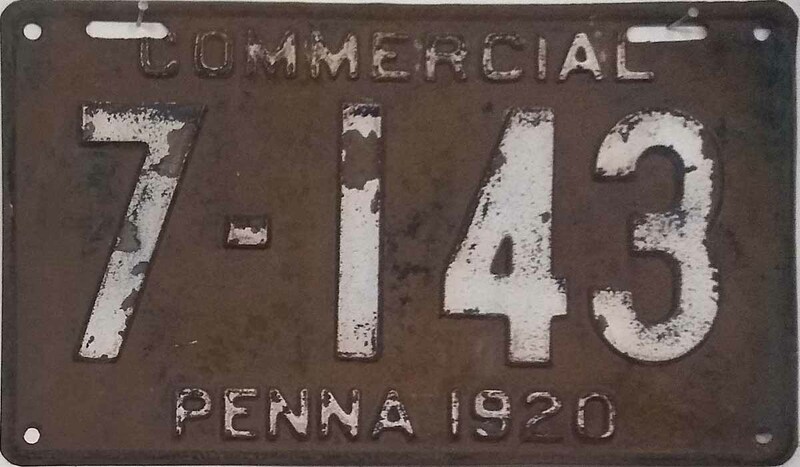 To the left side of the serial number PA embossed over embossed keystone. 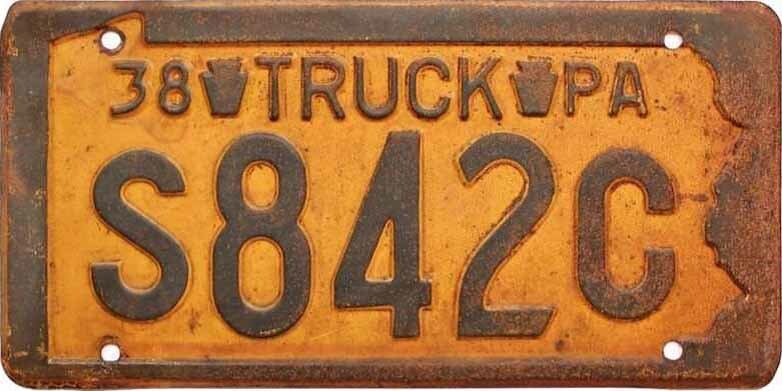 Maker's number was stamped into the keystone. 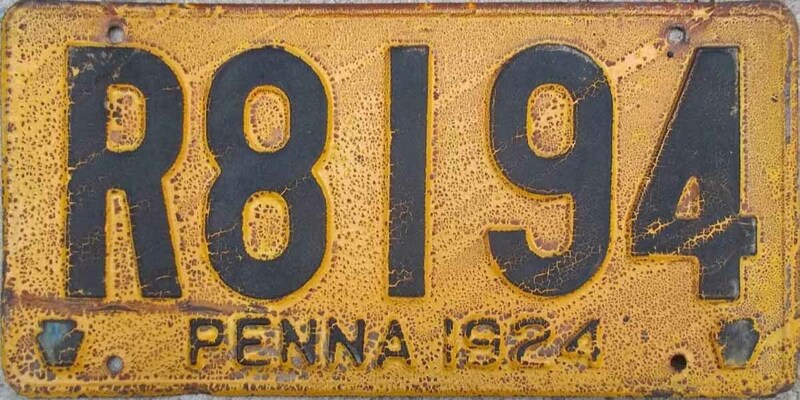 18 embossed below keystone. 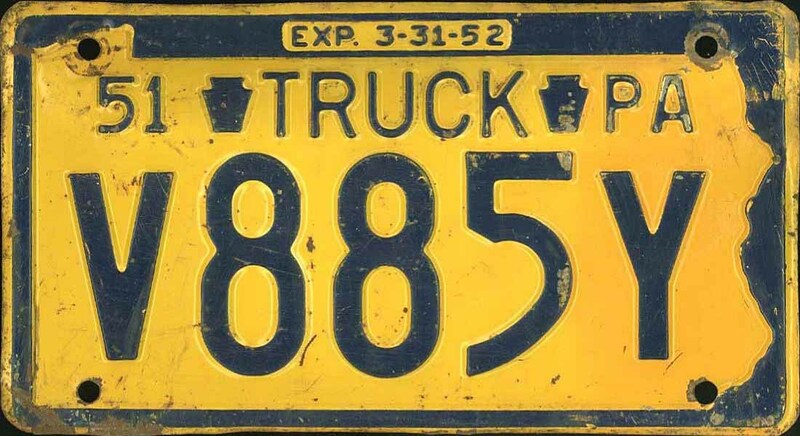 An aluminum keystone was only used if the plate was transferred to another vehicle. On the far left were 1 to 5 stars arranged vertically indicating the weight rating. 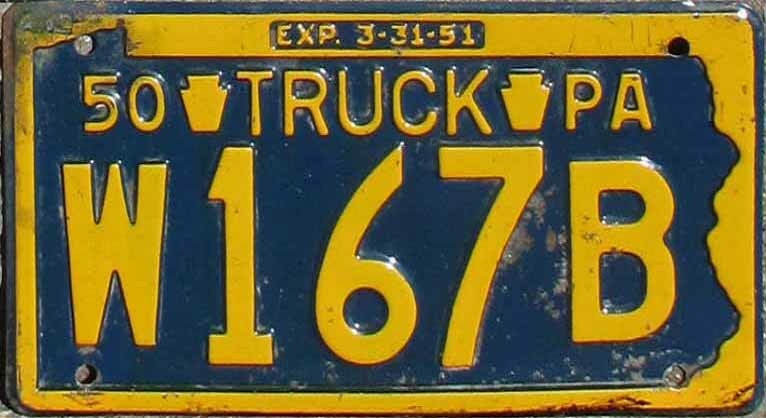 Issued in pairs. 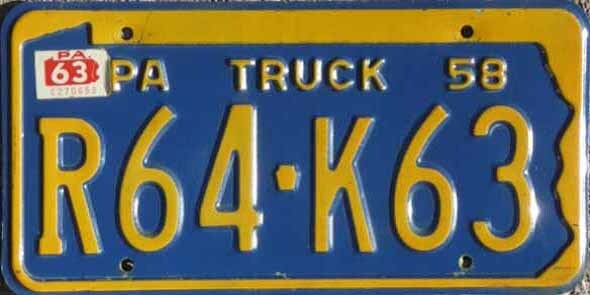 Plates were made in state prison system. 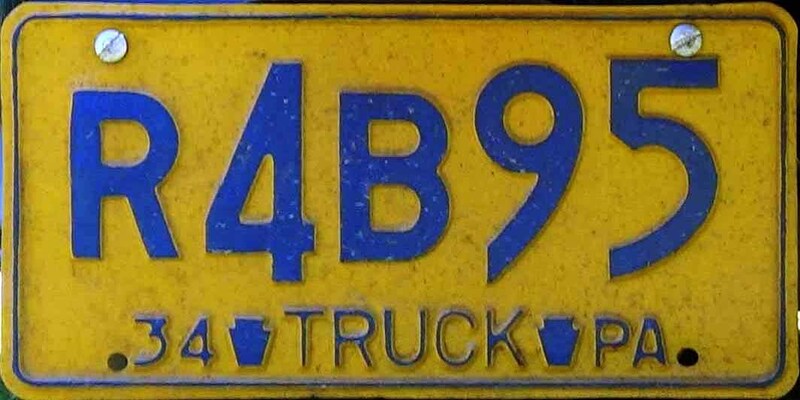 All truck plates used a C prefix plus 1 to 5 digits. 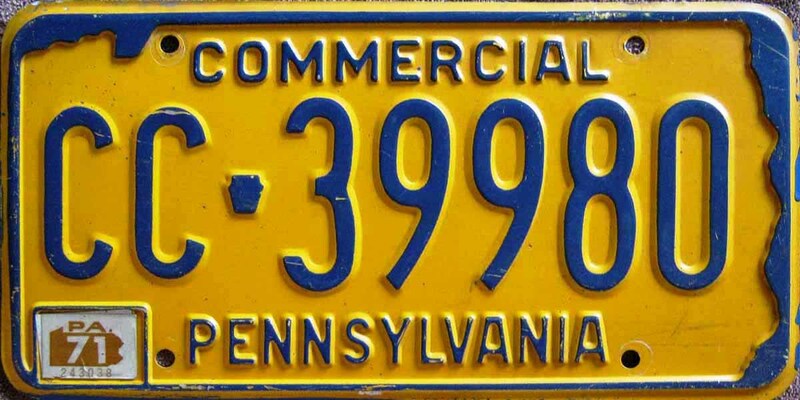 Plate measurements for C+1 or 2 digits are 6" x 10", C+3 digits are 6" x 13½", and C+4 or 5 digits were 6" x 16". 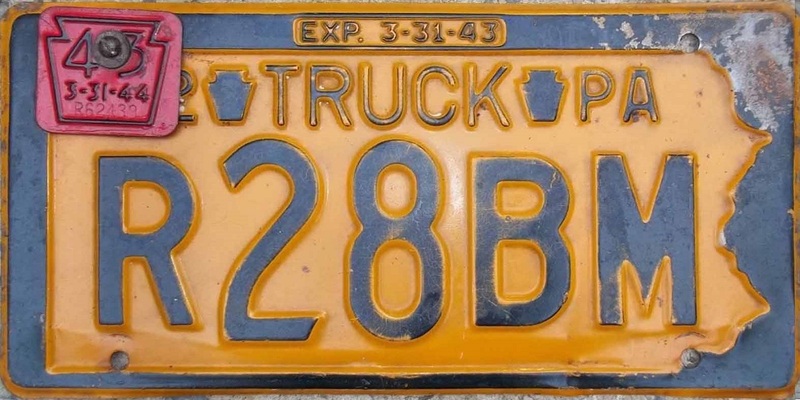 Red on black, legend, all embossed, PA over keystone over 19 to the right of the serial number. 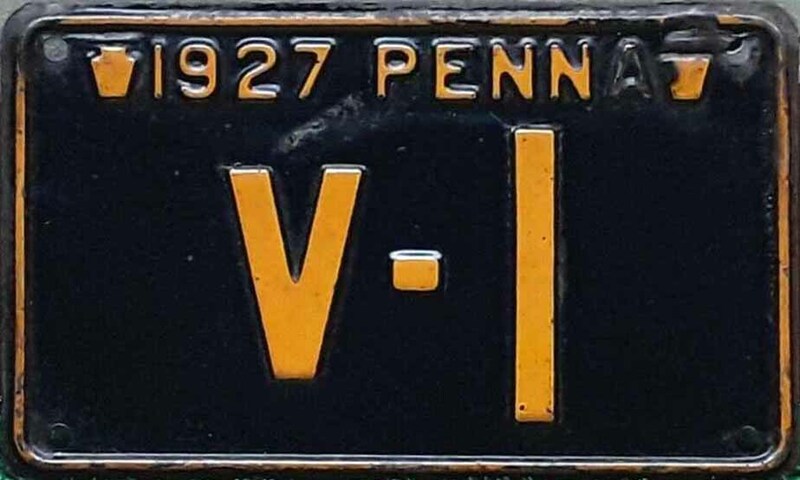 The keystone has the VIN number inscribed. 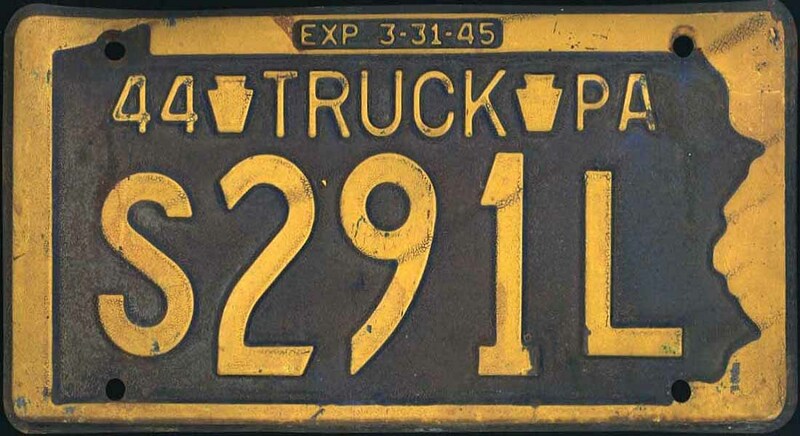 To the far right is a stack of 1 to 5 stars indicating the weight class of the vehicle. 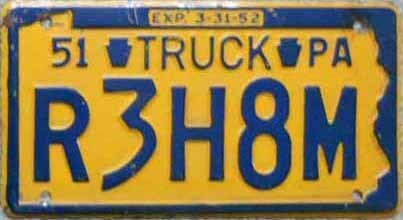 All truck plates used a C prefix plus 1 to 5 digits. C+1 or 2 digits were 6" x 10", C+3 digits were 6" x 13½", and C+4 or 5 digits were 6" x 16". 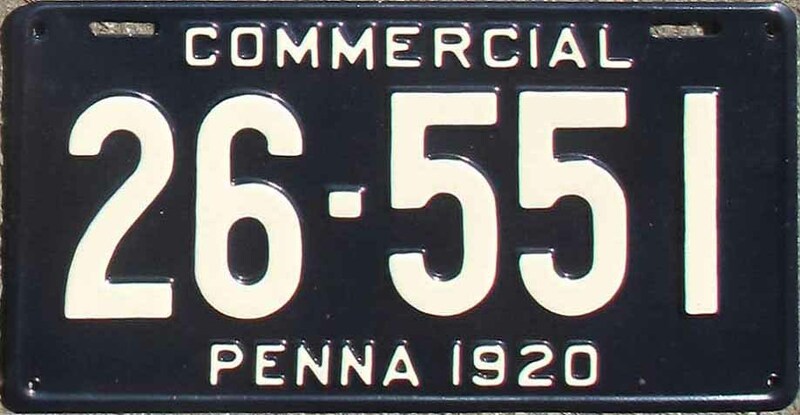 1 star, 6" x 13½"
2 star, 6" x 16"
White on dark blue, all embossed legend, plates with COMMERCIAL on top and PENNA 1920 along bottom and measure 7" high. 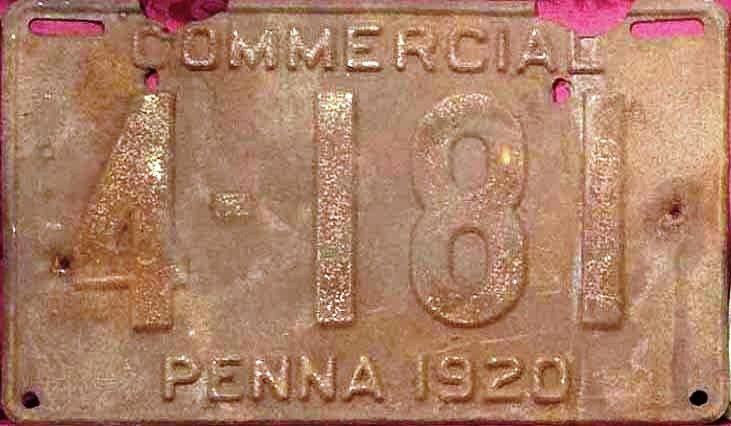 Plates with COMMERCIAL and PENNA 1920 along bottom measure 6" high. 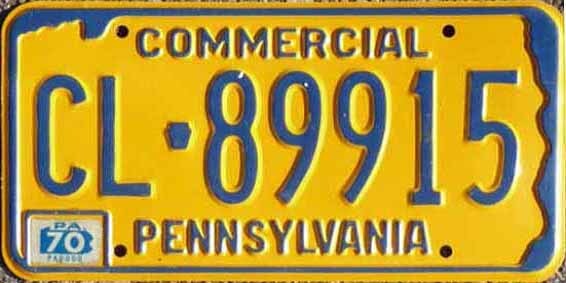 Plates with 4 or fewer digits measure 12 inches wide, 5 digit plates are 13½ inches, 6 digit plates measure 16 inches. 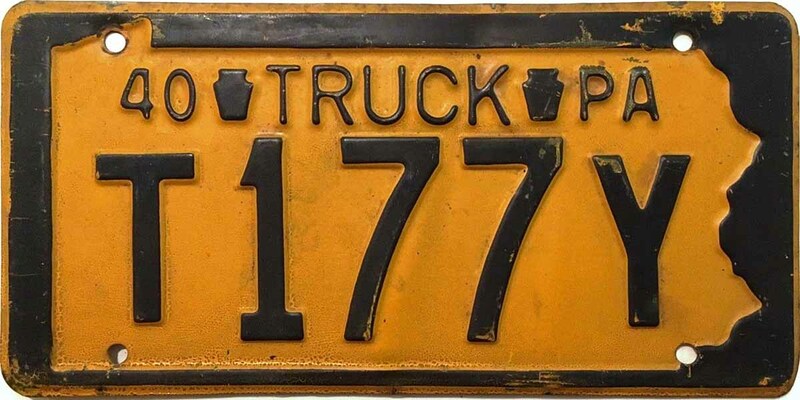 The connection between plate serial number and weight class is related to the first digit in the serial number. 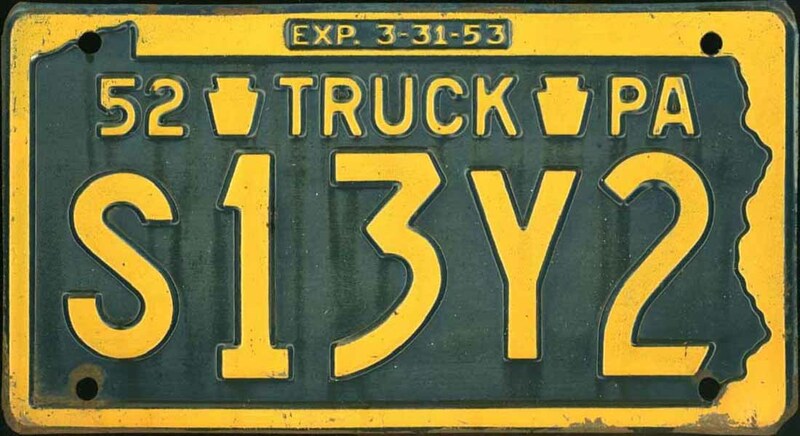 The serial number can be as short as three digits with no separation, or have 1 to 3 digits in the first grouping, then a dash, then the second grouping of 3 digits. 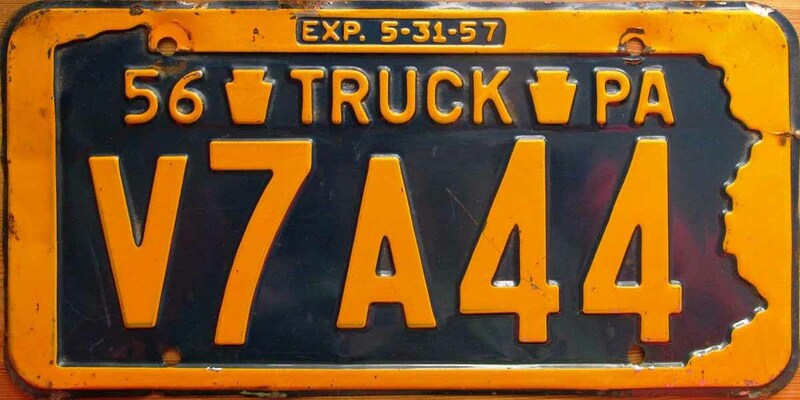 Class 1 or AA, 7" by 12"
Class 1 or AA, 7" by 13½"
Class 1 or AA, 6" by 16"
Class 1 or AA, 7" by 16"
Class 2 or A, 7" by 13½"
Class 2 or A, 7" by 16"
Class 3 or B, 6" by 16"
Class 4 or C, 7" by 12"
Class 7 or F, 7" by 12"
Black on yellow, all embossed legend, PENNA COMMERCIAL 1921 along bottom. 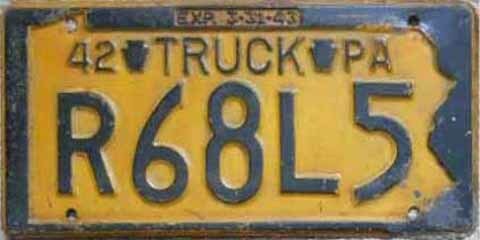 All plates are believed to be 6" by 16" regardless of the length of the serial number. 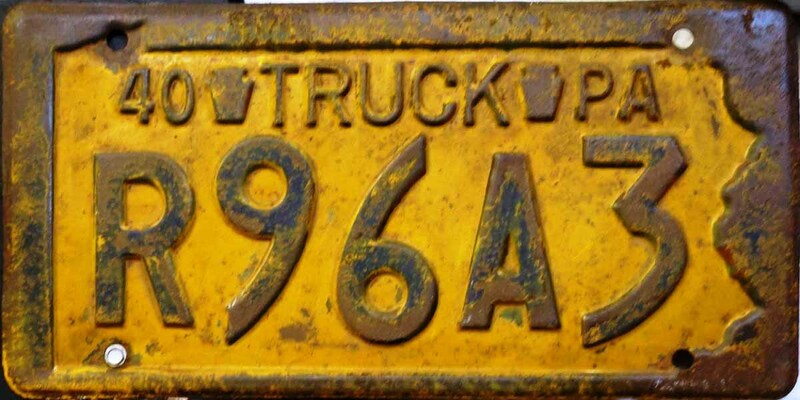 The connection between plate serial number and weight class may be related to the first digit in the serial number. The serial number can be as short as three digits with or without (?) separation, or or if longer, have 1 to 3 digits in the first grouping, then a dash, then the second grouping of 3 digits. 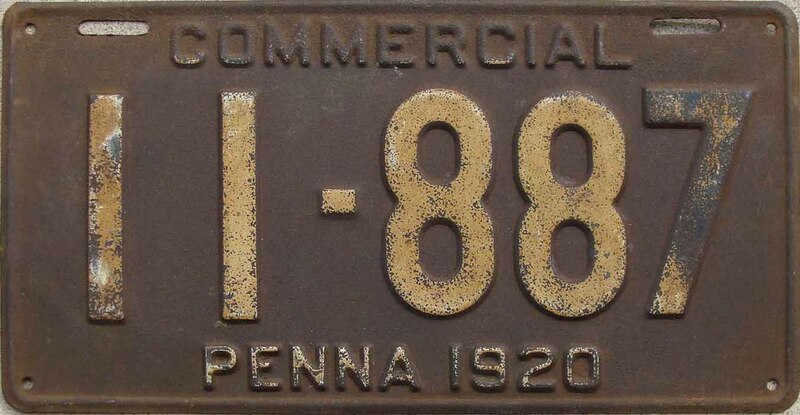 Brown on cream, legend, all embossed, PENNA COMMERCIAL 1922 along bottom. 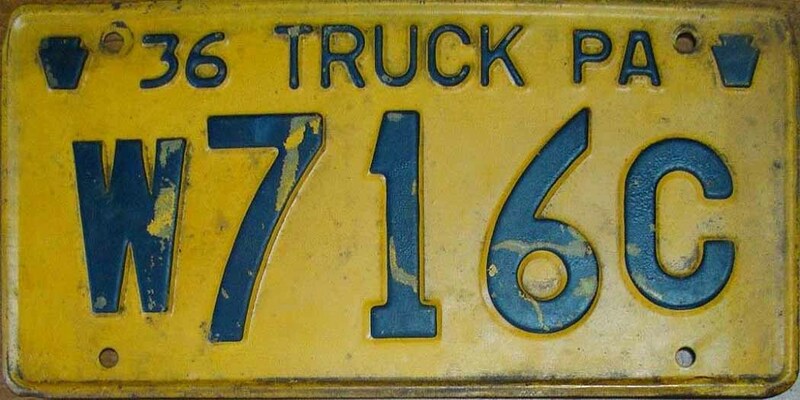 All plates are believed to be 6" by 16" regardless of the length of the serial number. 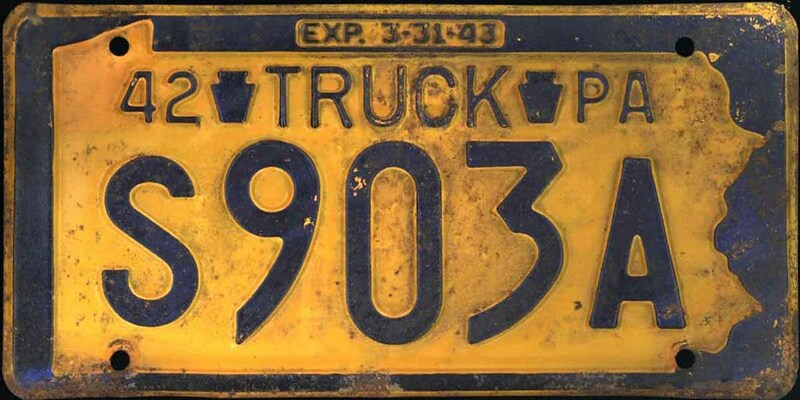 The connection between plate serial number and weight class is related to the first digit in the serial number. 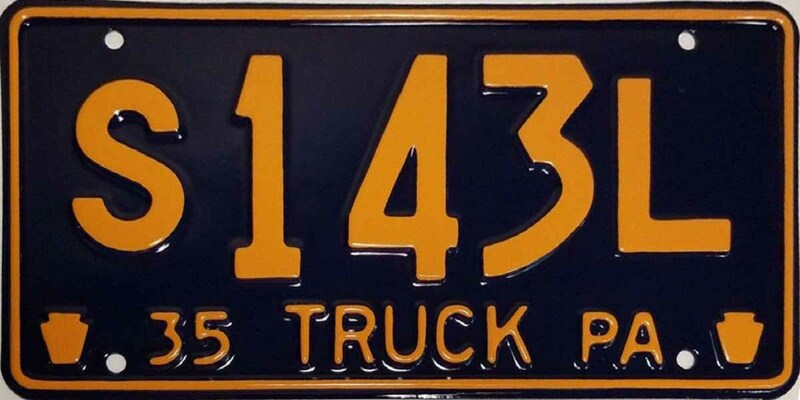 The serial number can be as short as three digits with or without separation, or or if longer, have 1 to 3 digits in the first grouping, then a dash, then the second grouping of 3 digits. 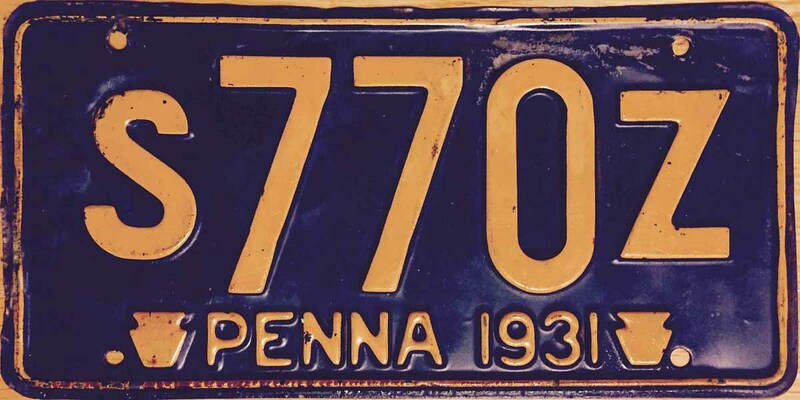 Yellow on dark blue, legend, all embossed, PENNA COMMERCIAL 1923 along bottom. See paragraph below on plate size. 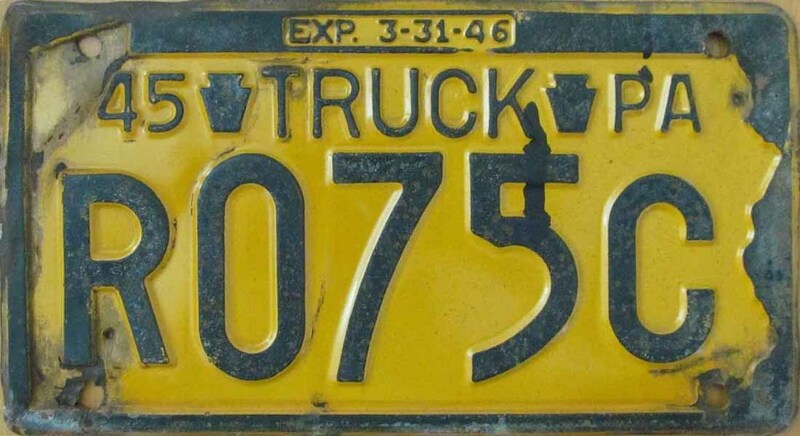 The connection between plate serial number and weight class is related to the first digit in the serial number. 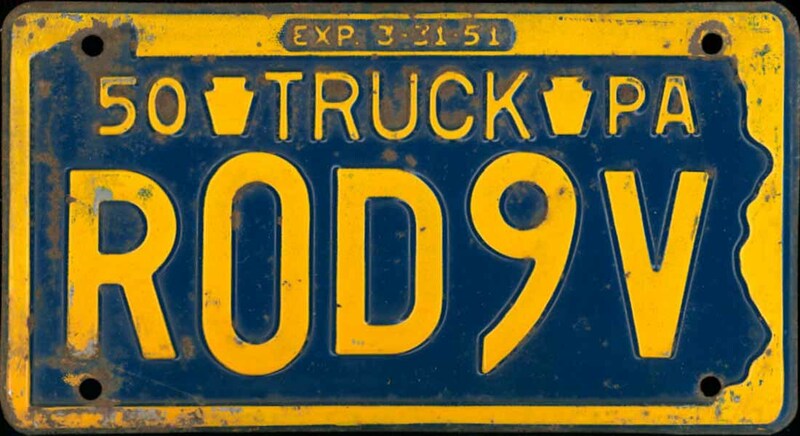 All plates were believed to be 6" by 16" regardless of the length of the serial number; however Rob Baran, in his research, has noted 2 sizes. 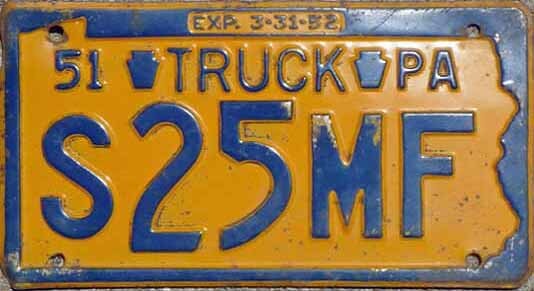 Most plates are 6" by 16"; however, two plates, 65-188 and another, actually measure 6" by 15". The 15-inch plates have the left side of the plate trimmed, and the beveled edge removed. He also notes that the positioning of the holes and the slots are reversed on the short plates. 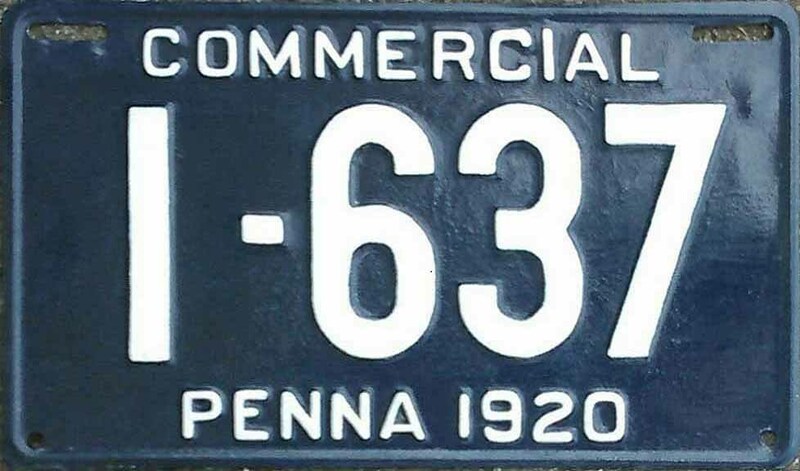 This information came from Rob Baran's article, Pennsylvania Commercial Plates 1920-1923 in February 2019 issue of Plates Magazine. 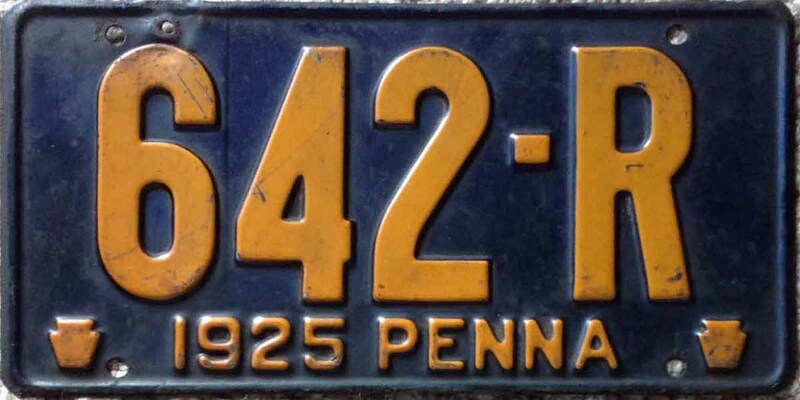 Class 5 or D, 6" x 15"
Dark blue on yellow, legend, all embossed, PENNA 1924 along bottom, legend flanked by small keystones. 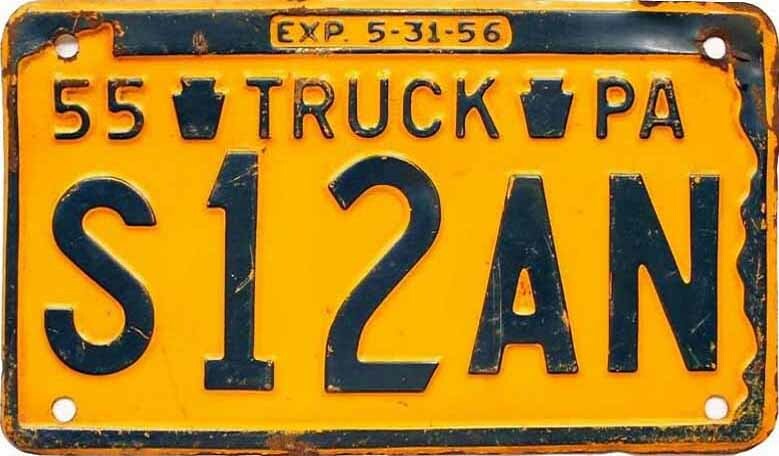 New letter weight classification system from R thru Z, excluding X, normally in the prefix position; however, there were R suffix overflow plates. 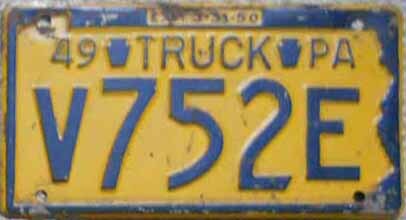 These letter classes identified the vehicle as a truck. Sizes were based on number of characters, 6" by 10" for 2 to 4 characters, 6" by 12" for 5 characters, and 6" by 15" for 6 characters. Yellow on dark blue, legend, all embossed, 1925 PENNA along bottom, legend flanked by small keystones. 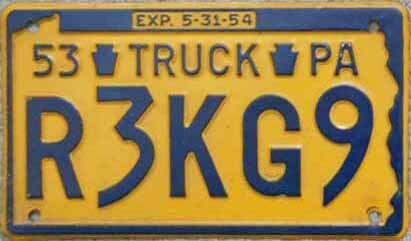 Weight classification system from R thru Z, excluding X, normally in the prefix position; however, there were R suffix overflow plates. 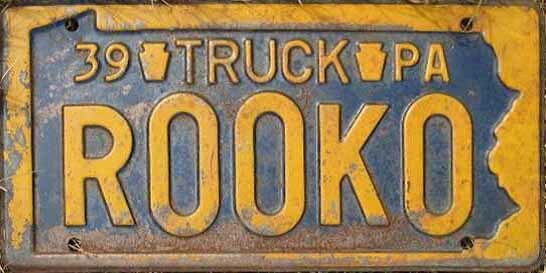 These letter classes identified the vehicle as a truck. Sizes were based on number of characters, 6" by 10" for 1 to 4 characters, 6" by 12 or 6" by 13" for 5 characters, and 6" by 15" for 6 characters. 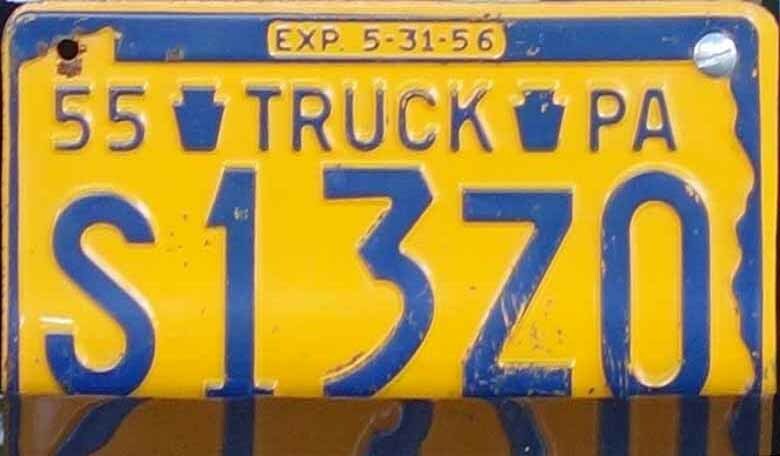 Not all plates conform to the sizes listed by character length. The use of the dash separator may be inconsistent. Dark blue on yellow, legend, all embossed, 1926 and PENNA along bottom, legend flanked by small keystones. 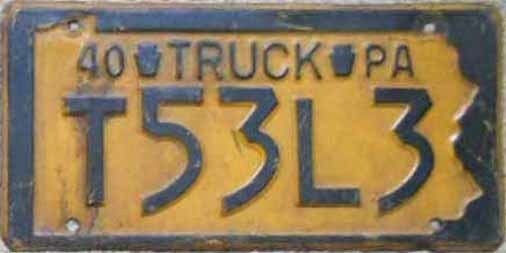 Letter weight classification system from R thru Z, excluding X, normally in the prefix position; however, there were R suffix overflow plates. 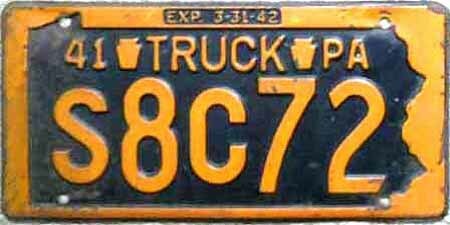 These letter classes identified the vehicle as a truck. 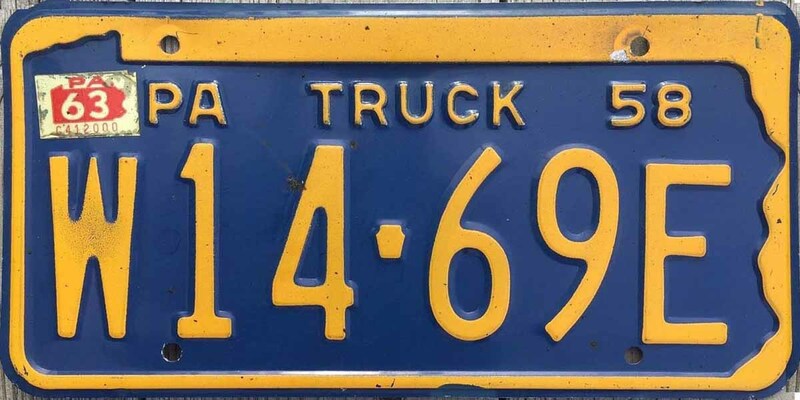 Sizes were generally based on number of characters, 6" by 10" for 2 and 3 characters, 6" by 12" for 4 characters, 6" by 13" for 5 characters, although some 5-character plates were 6" by 15" and 6" by 15" for 6 characters. 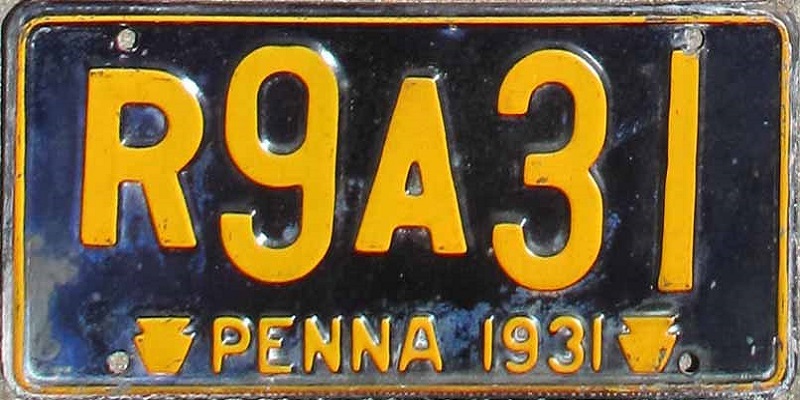 Class R suffix - 13"
Yellow on dark blue, legend, all embossed, 1927 and PENNA along top, legend flanked by small keystones. 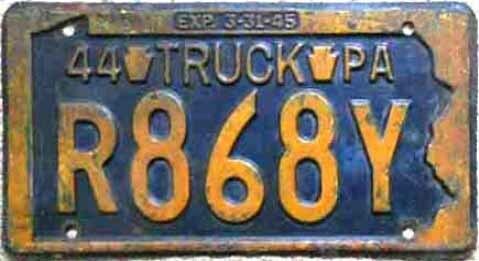 Weight classification system from R thru Z, excluding X, normally in the prefix position; however, there were R suffix overflow plates. 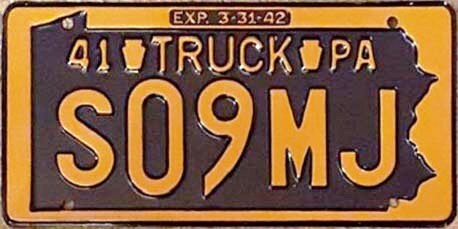 These letter classes identified the vehicle as a truck. Letter size in 1927 was smaller than numbers. Sizes were based on number of characters, 6" by 10" for 1 to 4 characters, 6" by 13" for 5 characters, and 6" by 15" for 6 characters. 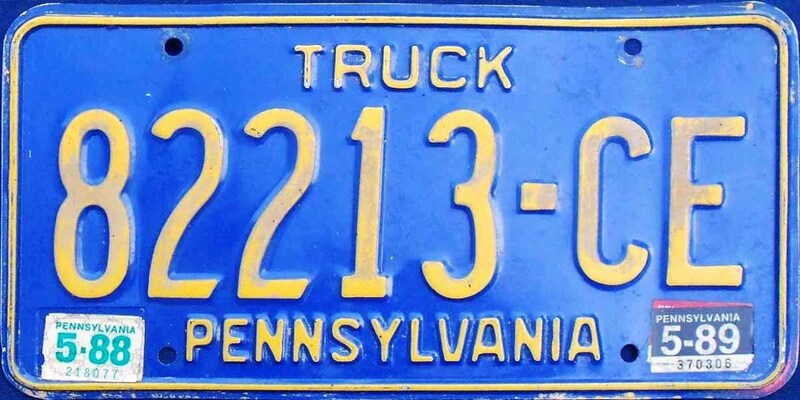 Dark blue over yellow, legend PENNA then 1928 flanked by small keystones. First letter designates weight class. Numerical portion can be 1 to 5 digits. 2, 3 & 4 character plates measure 6" x 10", 5 character plates measure 6" x 13", 6 character plates measure 6" x 15". Yellow on dark blue, legend, all embossed, 1929 and PENNA along top, legend flanked by small keystones. Weight classification system from R thru ZZ, excluding X. 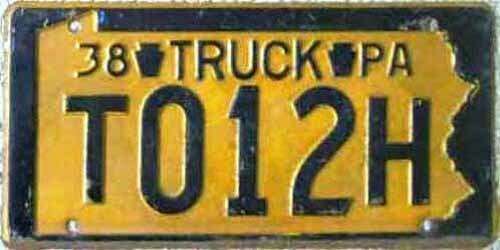 These letter classes identified the vehicle as a truck. 2, 3 & 4 character plates measure 6" x 10", 5 character plates measure 6" x 13", 6 character plates measure 6" x 15". 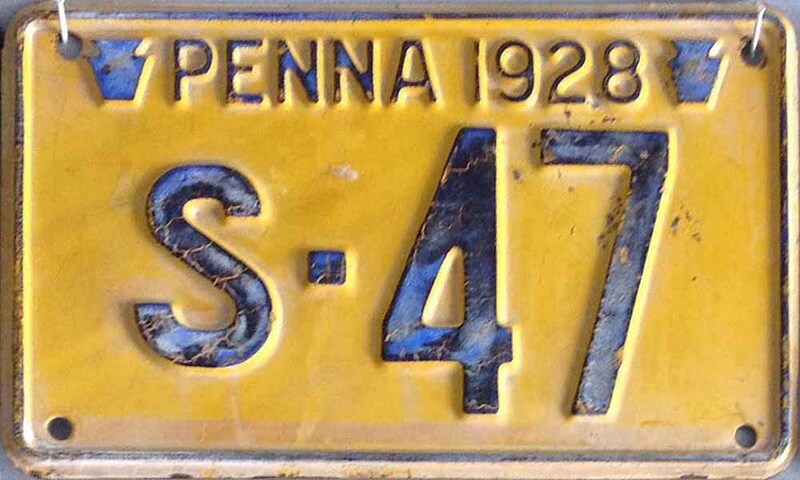 Dark blue over yellow, legend 1930 then PENNA along bottom flanked by small keystones. Final 2 letters designate weight class. Numerical portion can be 2 or 3 digits. 4 character plates measure 6" x 10", 5 character plates measure 6" x 12". *Much of the class data above came from a 1930 Bulletin Almanac. Yellow on dark blue, legend, all embossed, PENNA and 1931 along bottom, legend flanked by small keystones. Weight classification system from R thru ZZ, excluding X. 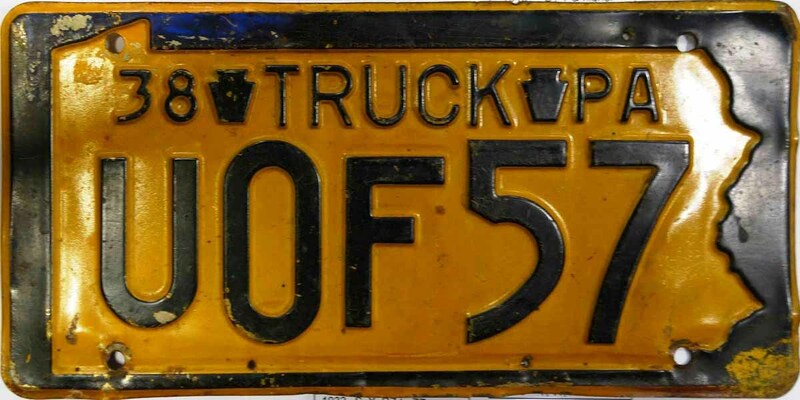 These letter classes identified the vehicle as a truck, always with a second letter in the serial number, and never in the second position. 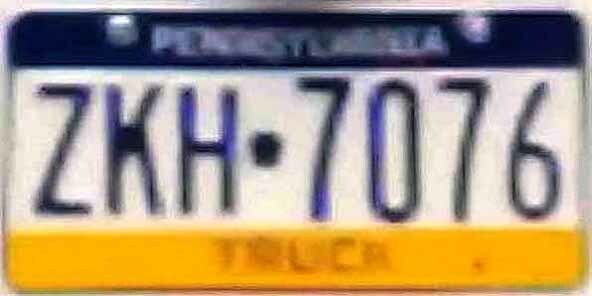 All plates appear to be 6" x 12. Class ZZ - formatting uncertain, possibly ZZ0A0 if used. 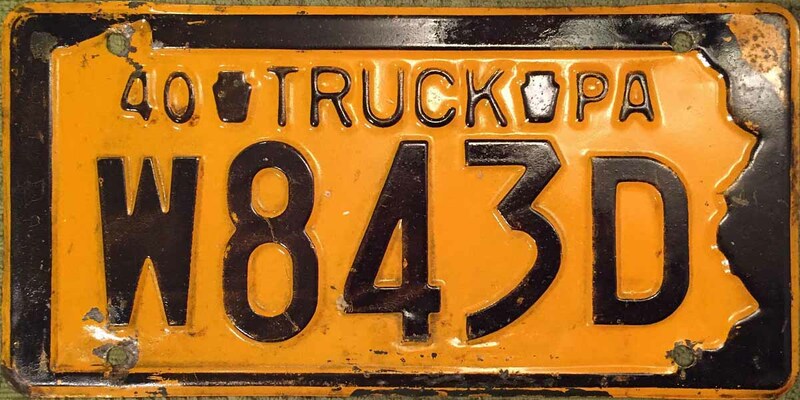 This mystery plate image was recently posted by Rick Kretschmer. 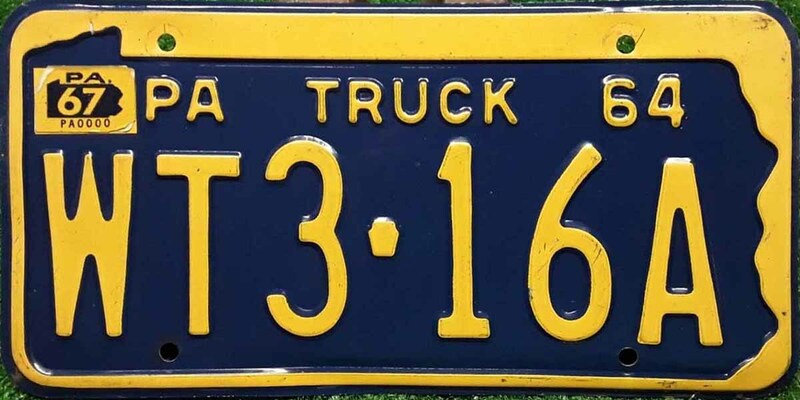 I contacted Rick and Eric Tanner for their take on the plate, as it does not fit any known 1931 format. 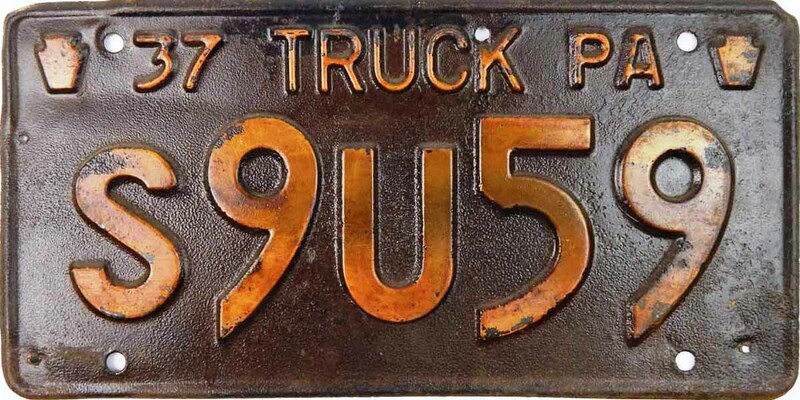 It should be noted that in 1931 Truck plates went back to using the R through Z prefix to indicate the weight class. 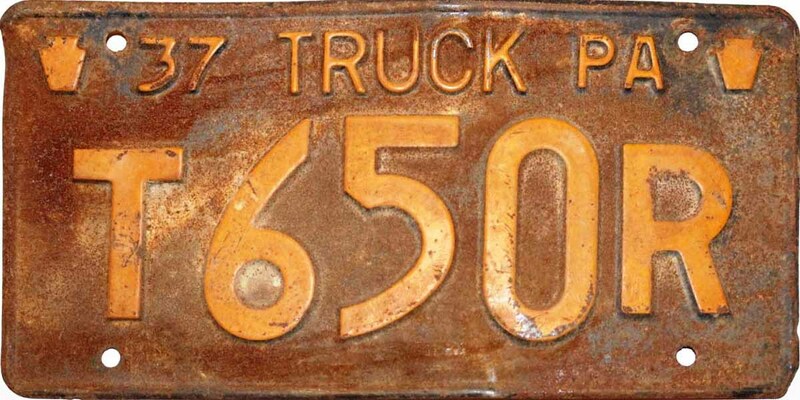 Eric offers a possible explanation where he suggests how this plate could be part of an early group of Truck plates. 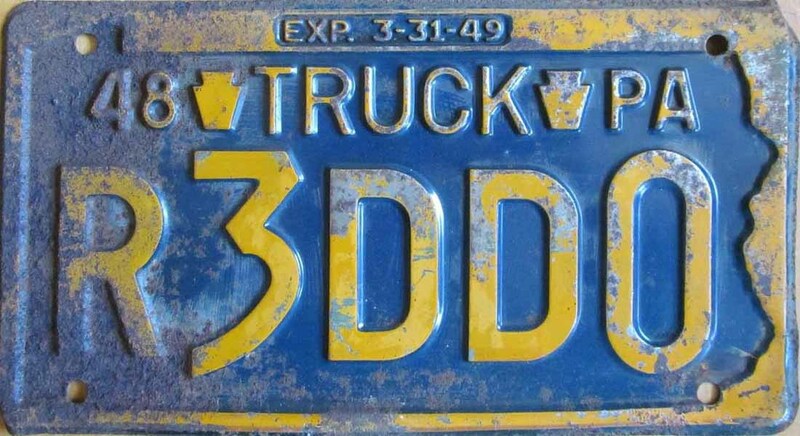 This plate is also not a stand-alone oddball or error. 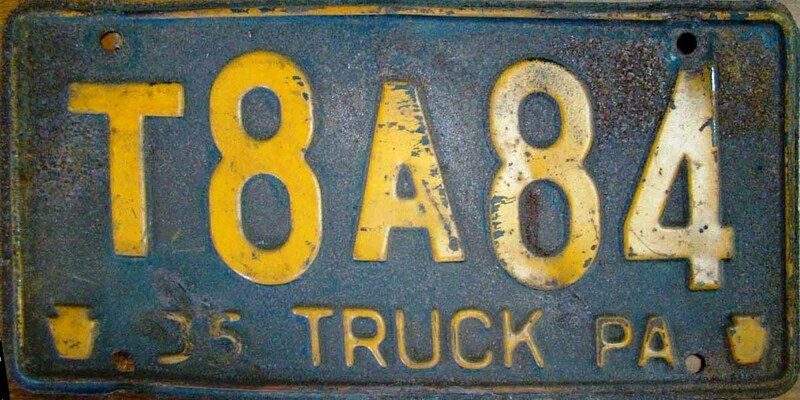 Enough 2 and 3 digit plates with 2-letter suffixes have been seen including 96AC, 793AC, 277AH, 176BB pair, 43BC and 987BC suggesting these are part of a series. 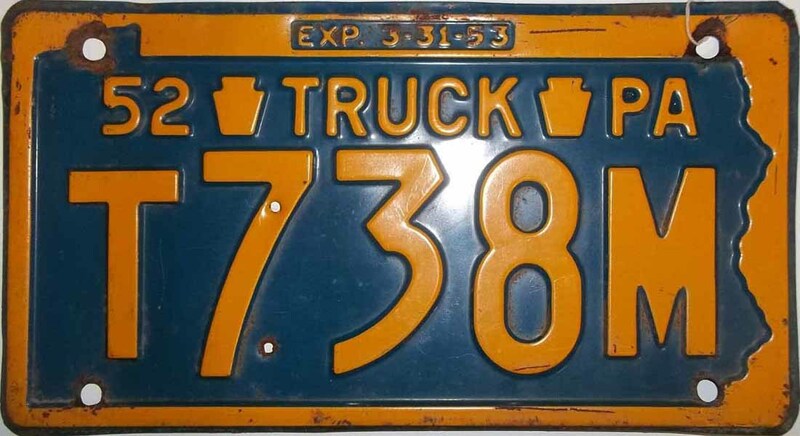 Eric suggests that the plate shown here is part of a group of 1931 R-weight truck tags which were made well ahead of time using the 1930 system before the decision was made to switch to a new system for 1931 truck plates. Maybe they ran off 25,000 pairs before the change? That would take us from 00AA to 999BE. Too many to waste, so they issued them anyway, Eric offers as a possible explanation. 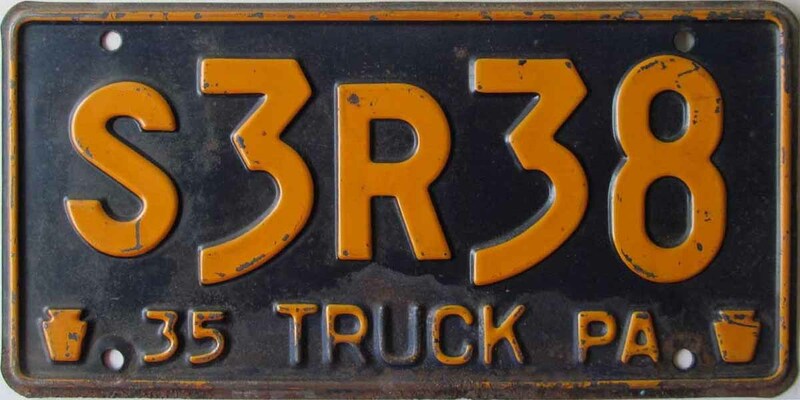 Eric has also done some math calculations, adding up the known number of R-series plates, plus the series described here, resulting in a total number of plates similar to 1929 and '30 plates. While this is only a theory at this point, and lacks proof, it does offer a plausible explanation. 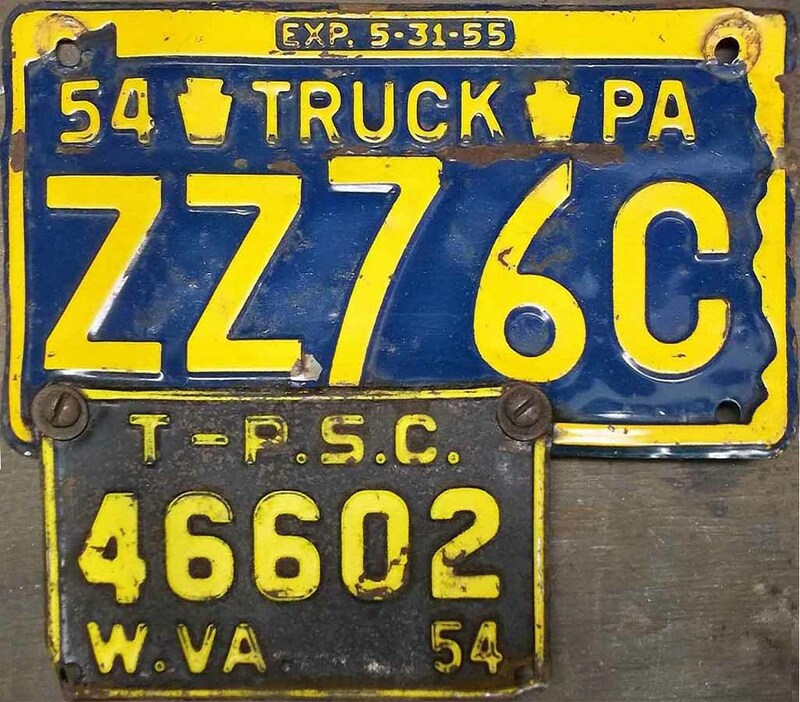 Dark blue over yellow, legend PENNA then 1932 then across top flanked by small keystones. 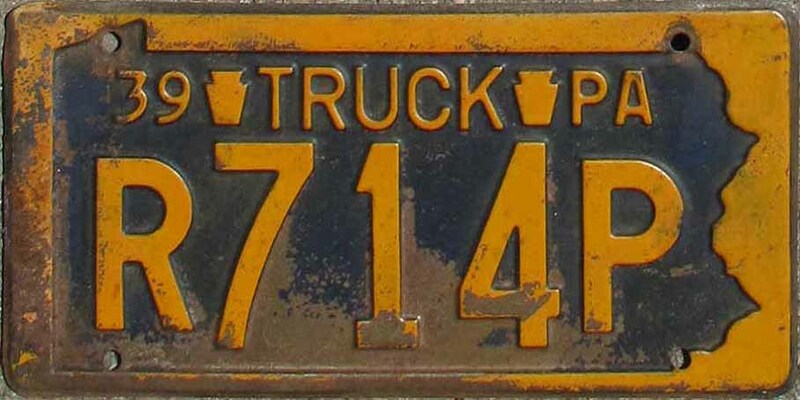 First 1 or 2 letters designate weight class. Numerical portion can be 5 or 4 digits for a total of 6 characters. Plate measures 6" x 15". *Classes authorized but likely not issued. Yellow on dark blue, legend, all embossed, PENNA and 1933 along top, legend flanked by small keystones. Weight classification system from R thru ZZ, excluding X. 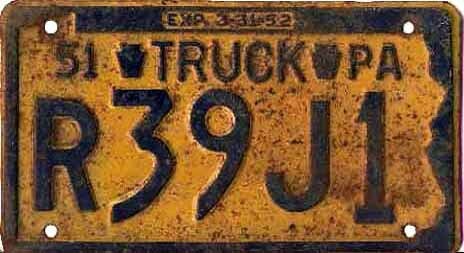 These letter classes identified the vehicle as a truck. Plate measures 6" x 15". 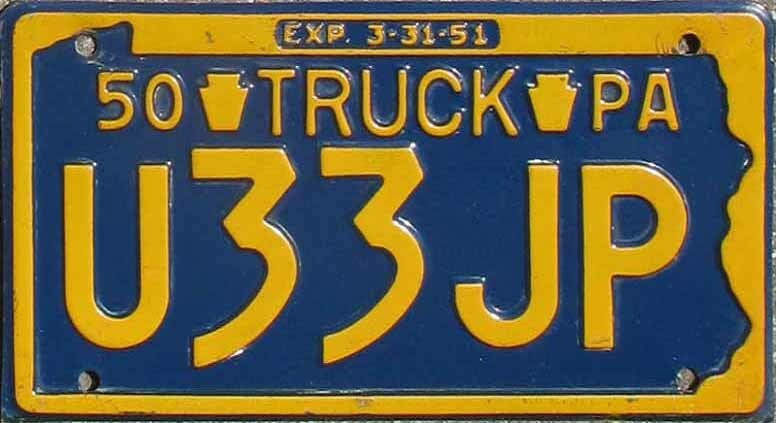 Dark blue over yellow, legend 34 then TRUCK flanked by small keystones then PA across bottom. 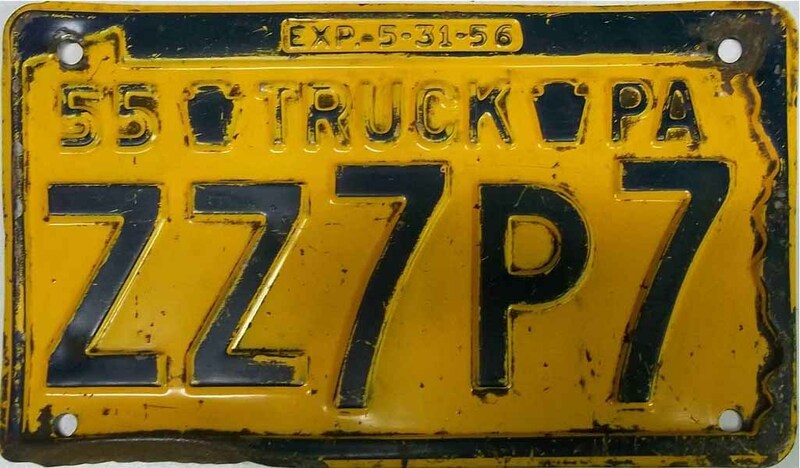 First letter from R thru Z excluding X, not followed by Z designates the weight classis for a 2-axle truck; first letter from R thru Z excluding X, followed by Z designates the weight classis for a 3-axle truck, remaining 3 characters will include an additional letter in the final position. See formatting below. Plate measures 6" x 12". Yellow over dark blue, legend 35 then TRUCK then PA flanked by small keystones across bottom. 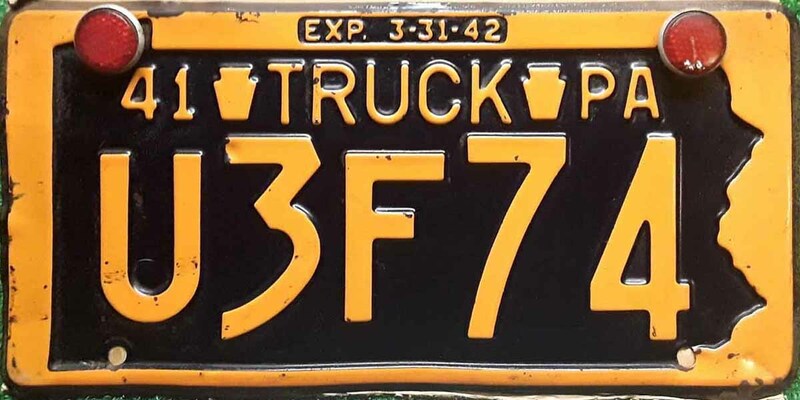 First letter from R thru Z excluding X, not followed by Z designates the weight classis for a 2-axle truck; first letter from R thru Z excluding X, followed by Z designates the weight classis for a 3-axle truck, remaining 3 characters will include an additional letter in the final position. See formatting below. 5-character plates measure 6" x 12", 6-character plates measure 6" x 15". 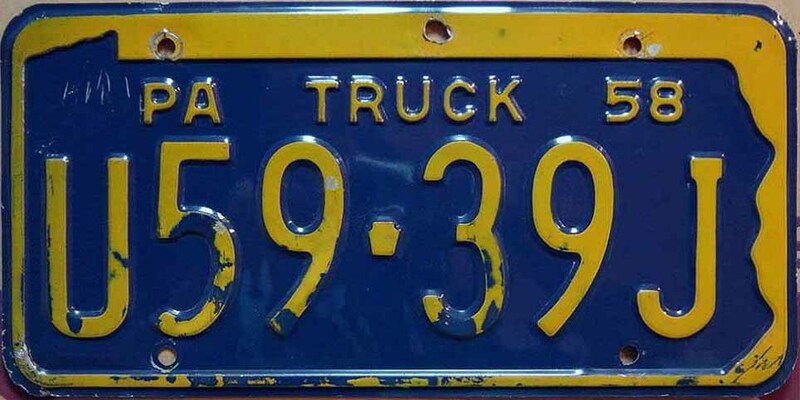 Dark blue over yellow, legend 36 then TRUCK then PA flanked by small keystones across top. 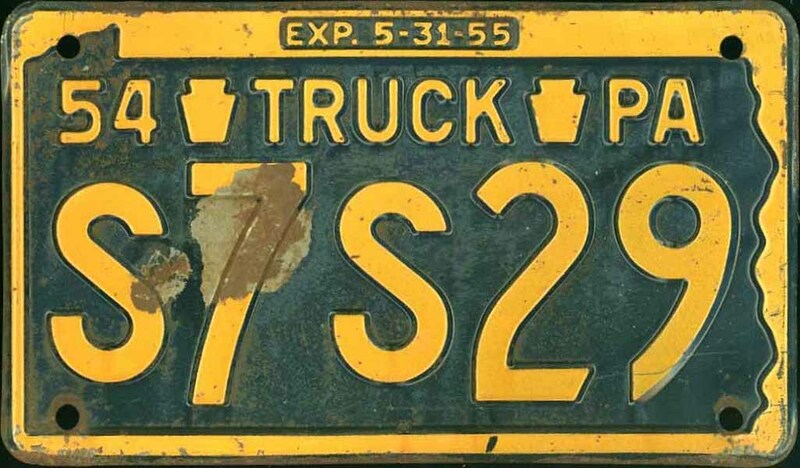 First letter from R thru Z excluding X, not followed by Z designates the weight classis for a 2-axle truck; first letter from R thru Z excluding X, followed by Z designates the weight classis for a 3-axle truck, remaining 3 characters will include an additional letter in the final position. See formatting below. 5-character plates measure 6" x 12", 6-character plates measure 6" x 15". 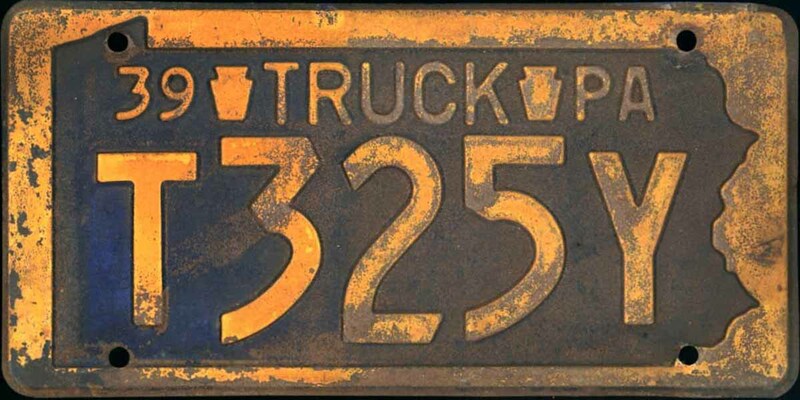 Yellow over dark blue, legend 37 then TRUCK then PA flanked by small keystones across top. 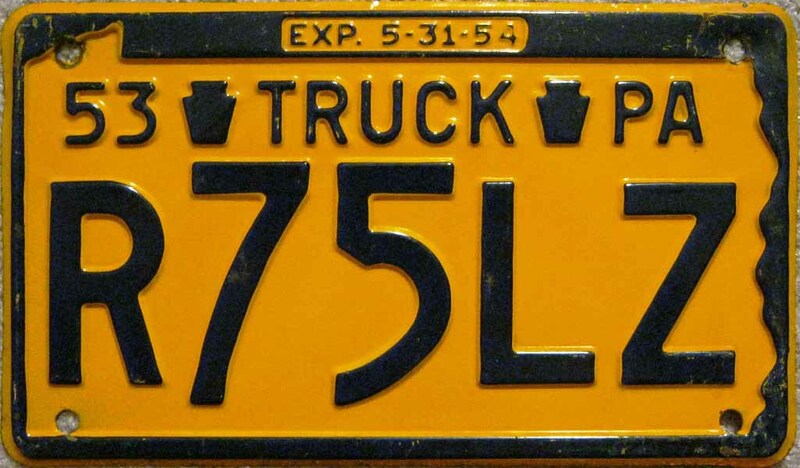 First letter from R thru Z excluding X, not followed by Z designates the weight classis for a 2-axle truck; first letter from R thru Z excluding X, followed by Z designates the weight classis for a 3-axle truck, remaining 3 characters will include an additional letter in the final position. See formatting below. 5-character plates measure 6" x 12", 6-character plates measure 6" x 15". 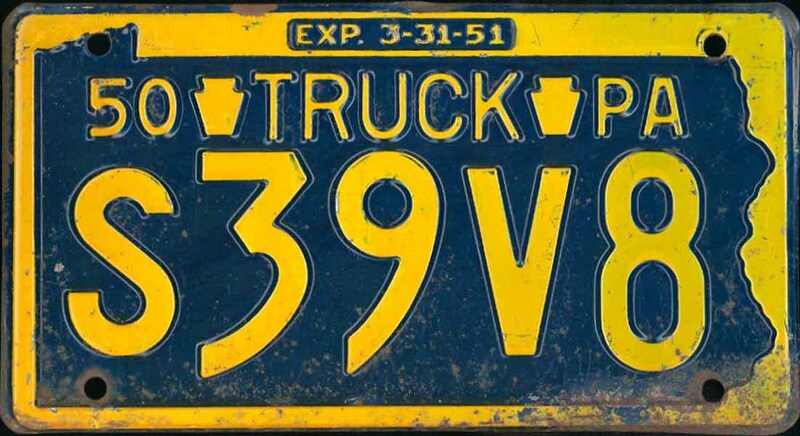 Dark blue over yellow, map outline border, legend 38 then TRUCK flanked by small keystones then PA across top. 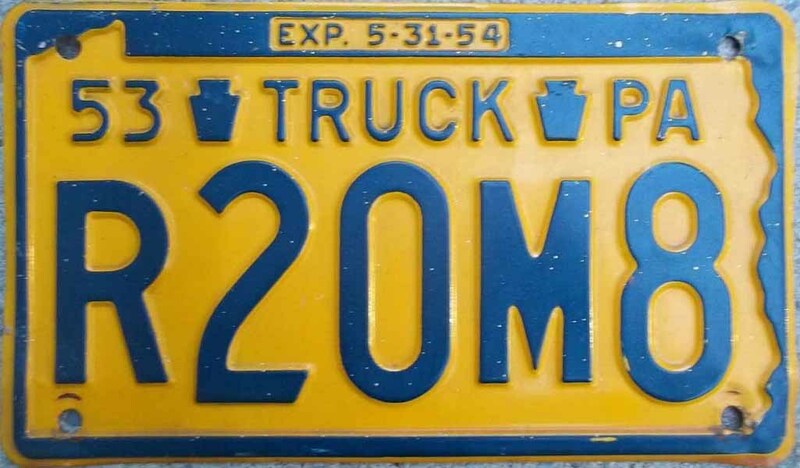 First letter from R thru Z excluding X, not followed by Z designates the weight classis for a 2-axle truck; first letter from R thru Z excluding X, followed by Z designates the weight classis for a 3-axle truck, remaining 3 characters will include an additional letter in the final position. See formatting below. 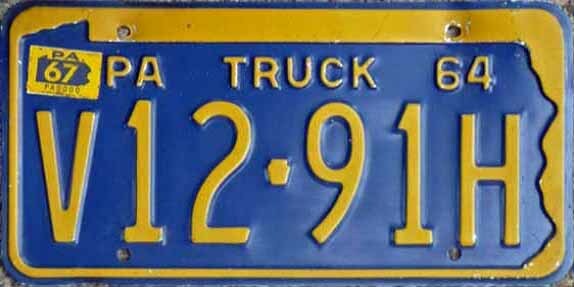 All plates are 5-character and measure 6" x 12". 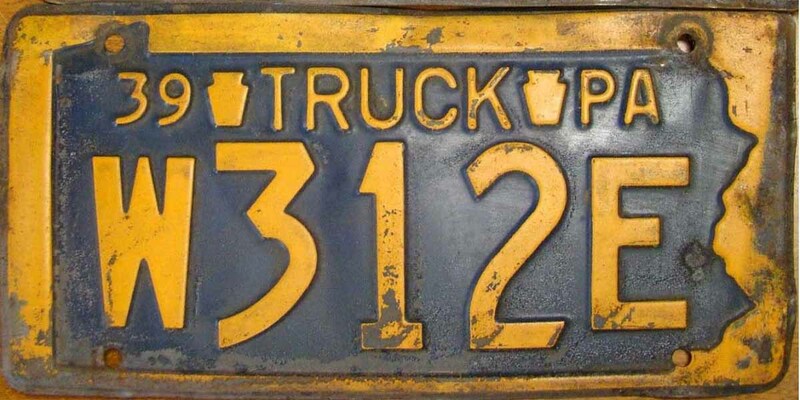 Yellow over dark blue, map outline border, legend 39 then TRUCK flanked by small keystones then PA across top. 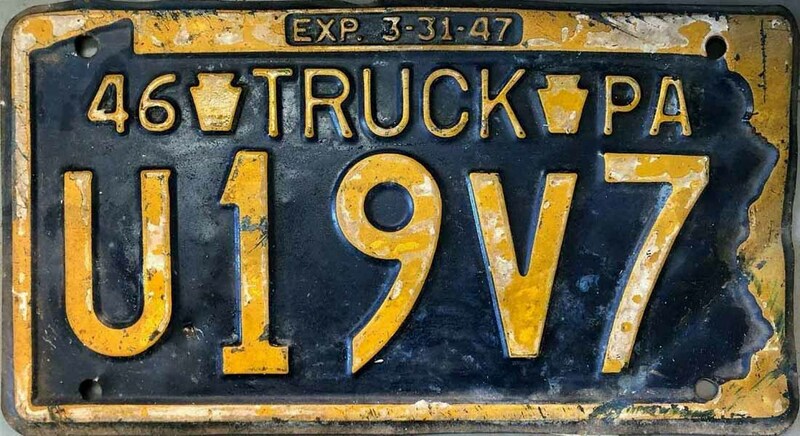 First letter from R thru Z excluding X, not followed by Z designates the weight classis for a 2-axle truck; first letter from R thru Z excluding X, followed by Z designates the weight classis for a 3-axle truck, remaining 3 characters will include an additional letter in the final position. See formatting below. 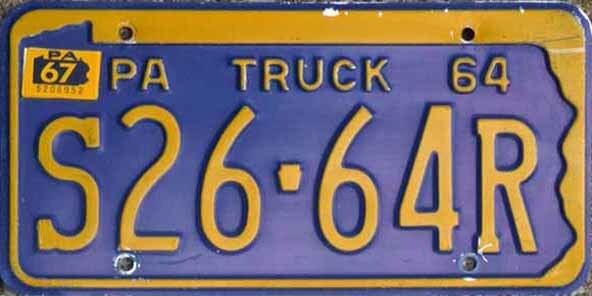 All plates are 5-character and measure 6" x 12". 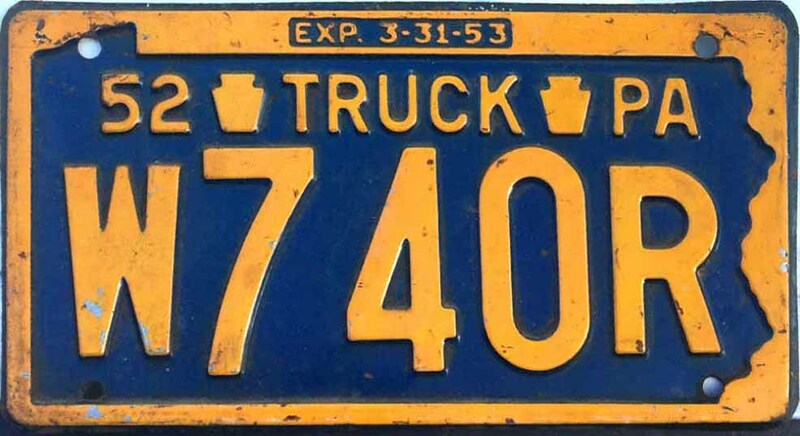 Dark blue over yellow, map outline border, legend 40 then TRUCK flanked by small keystones then PA across top. 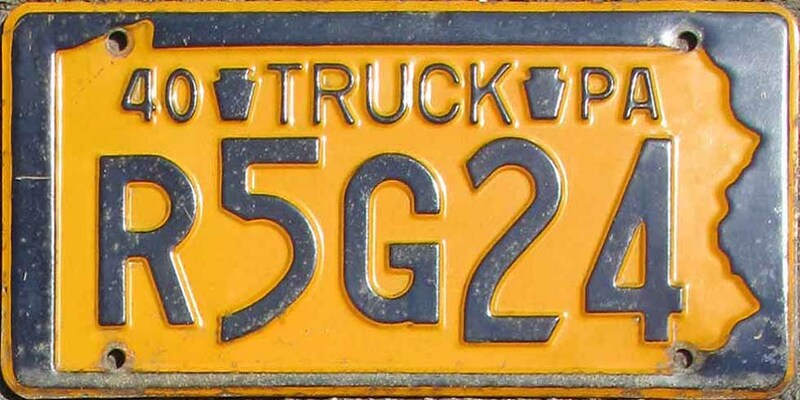 First letter from R thru Z excluding X, not followed by Z designates the weight classis for a 2-axle truck; first letter from R thru Z excluding X, followed by Z designates the weight classis for a 3-axle truck, remaining 3 characters will include an additional letter in the final position. See formatting below. 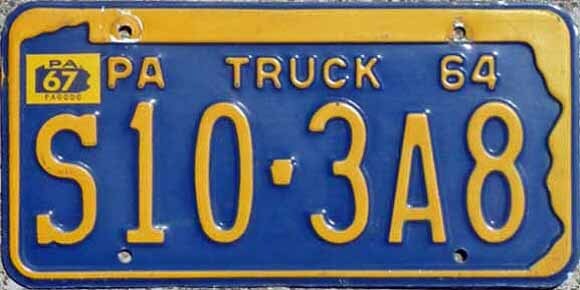 All plates are 5-character and measure 6" x 12". 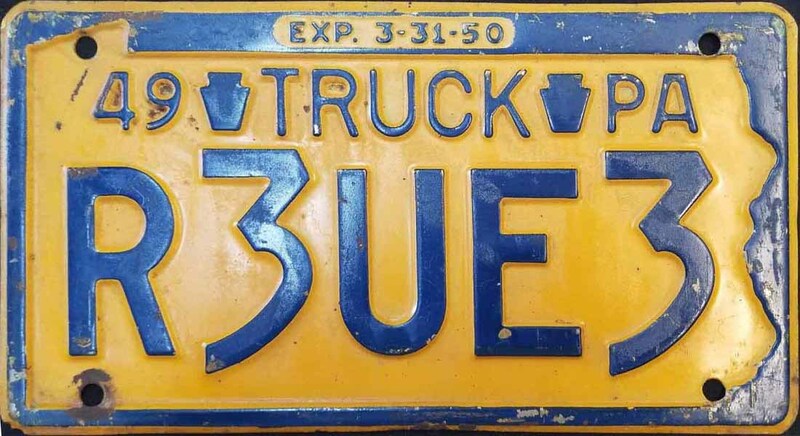 Yellow on dark blue, map outline with EXP 3-31-42 in top border, legend 41 then TRUCK flanked by keystones then PA. All plates are 5 characters, first letter from R thru Z excluding X, not followed by Z designates the weight classis for a 2-axle truck; first letter from R thru Z excluding X, followed by Z designates the weight classis for a 3-axle truck, remaining 3 characters will include an additional letter in the final position. 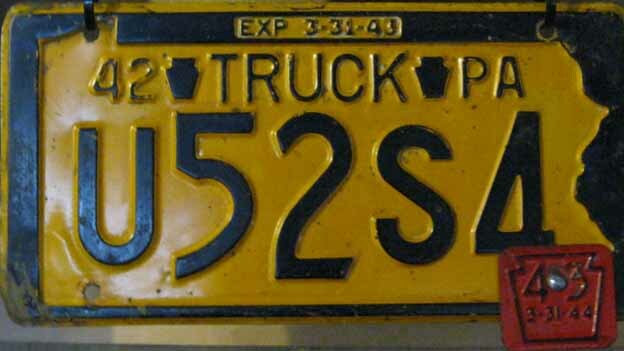 Plate measures 6" x 12", and are issued in pairs. 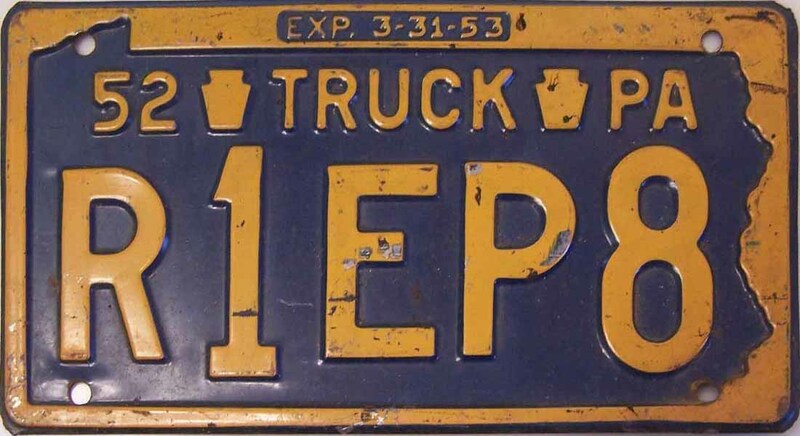 Dark blue over yellow, map outline with EXP 3-31-43 (or EXP without the period) in top border, legend 42 then TRUCK flanked by keystones then PA. All plates are 5 characters, first letter from R thru Z excluding X, not followed by Z designates the weight classis for a 2-axle truck; first letter from R thru Z excluding X, followed by Z designates the weight classis for a 3-axle truck, remaining 3 characters will include an additional letter in the final position. 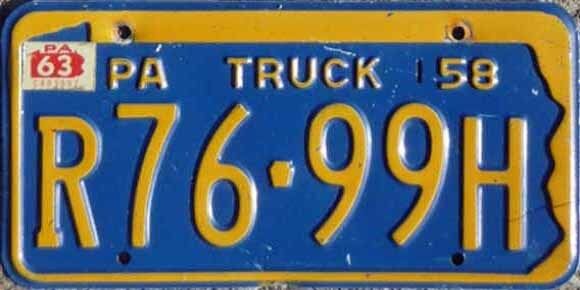 Plate measures 6" x 12", and are issued in pairs. 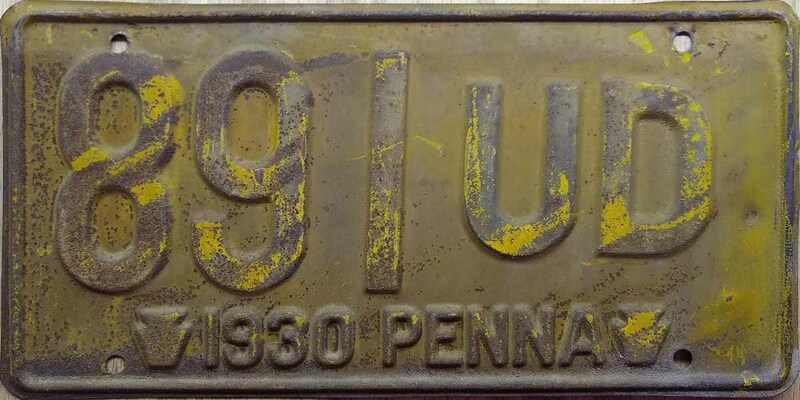 These tabs were issued in lieu of regular plates to save steel during the war years and were to be bolted over top of 1942 plates. 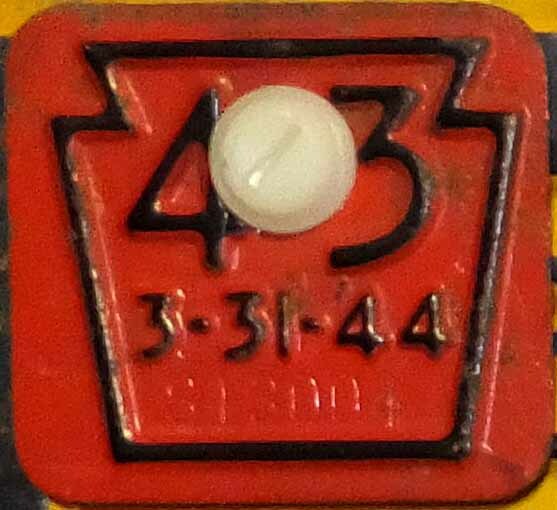 The tabs measured 1⅞ by 2⅛, were made of steel, painted red, had 43 painted black and embossed with the 4 and the 3 to the left and right of the bolt hole. 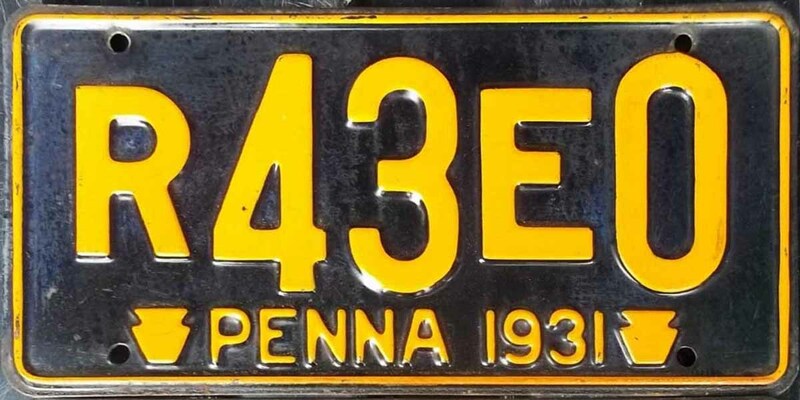 Below the 43 was the expiration date of 3-31-44, below that etched into the tab was a serial number of up to 6 characters made up of an alpha character and up to 5 digits, with the alpha character corresponding to the weight class prefix. Yellow on dark blue, map outline with EXP. 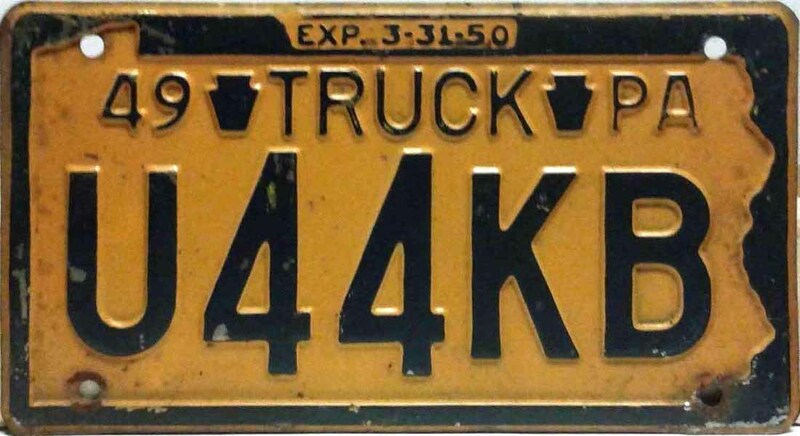 3-31-45 in top border, legend 44 then TRUCK flanked by keystones then PA. All plates are 5 characters, first letter from R thru Z excluding X, not followed by Z designates the weight classis for a 2-axle truck; first letter from R thru Z excluding X, followed by Z designates the weight classis for a 3-axle truck, remaining 3 characters will include an additional letter in the final position. 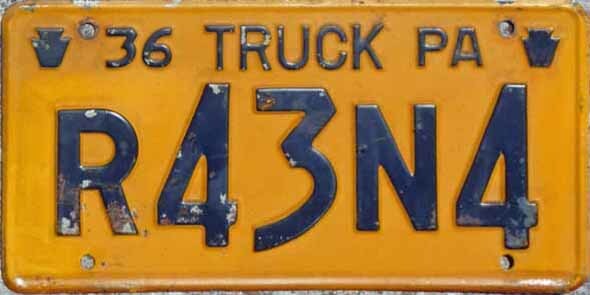 Plate measures 6" x 11", and are issued in pairs. 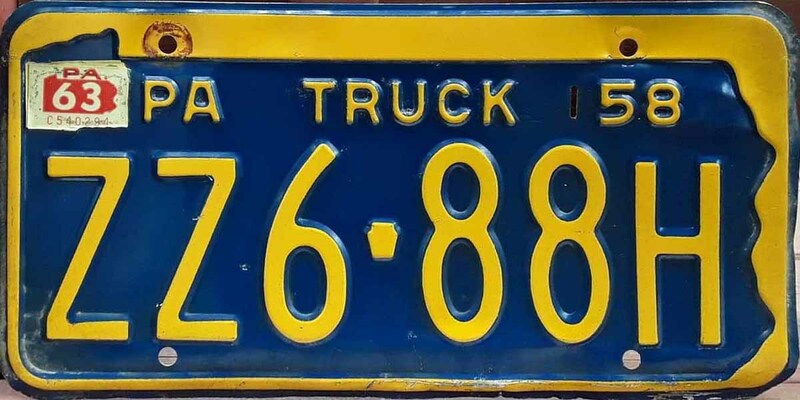 Dark blue on yellow, map outline with EXP. 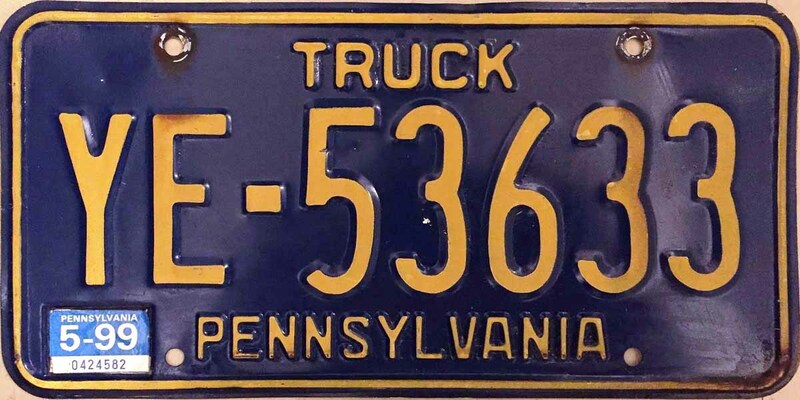 3-31-46 in top border, legend 45 then TRUCK flanked by keystones then PA. All plates are 5 characters, first letter from R thru Z excluding X, not followed by Z designates the weight classis for a 2-axle truck; first letter from R thru Z excluding X, followed by Z designates the weight classis for a 3-axle truck, remaining 3 characters will include an additional letter in the final position. Plate measures 6" x 11". 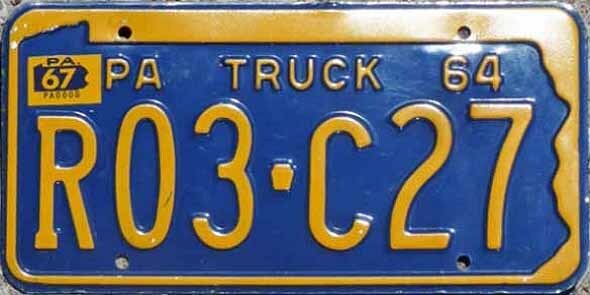 Plates are issued as singles. Yellow on dark blue, map outline with EXP. 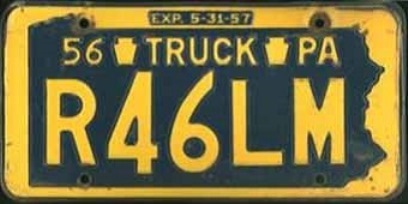 3-31-47 in top border, legend 46 then TRUCK flanked by keystones then PA. All plates are 5 characters, first letter from R thru Z excluding X, not followed by Z designates the weight classis for a 2-axle truck; first letter from R thru Z excluding X, followed by Z designates the weight classis for a 3-axle truck, remaining 3 characters will include an additional letter in the final position. 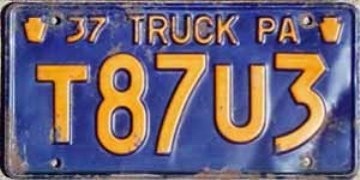 Plate measures 6" x 11", and are issued in pairs. 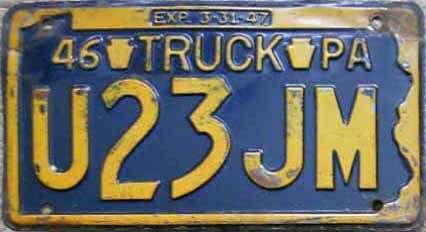 Dark blue on yellow, map outline with EXP. 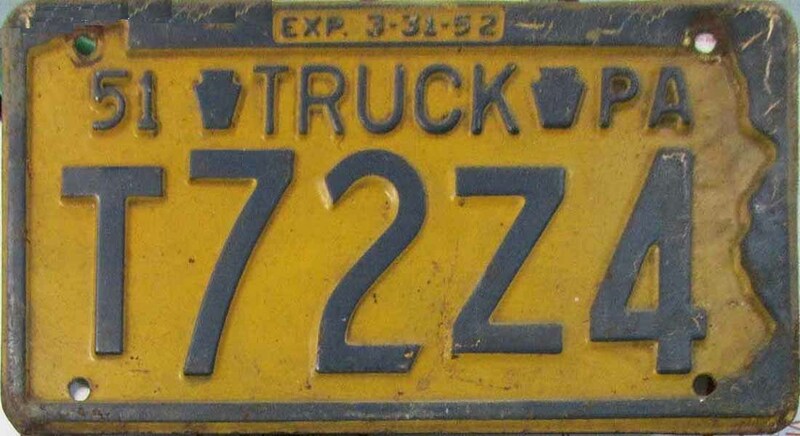 3-31-48 in top border, legend 47 then TRUCK flanked by keystones then PA. All plates are 5 characters, first letter from R thru Z excluding X, not followed by Z designates the weight classis for a 2-axle truck; first letter from R thru Z excluding X, followed by Z designates the weight classis for a 3-axle truck, remaining 3 characters will include an additional letter in the final position. Plate measures 6" x 11". 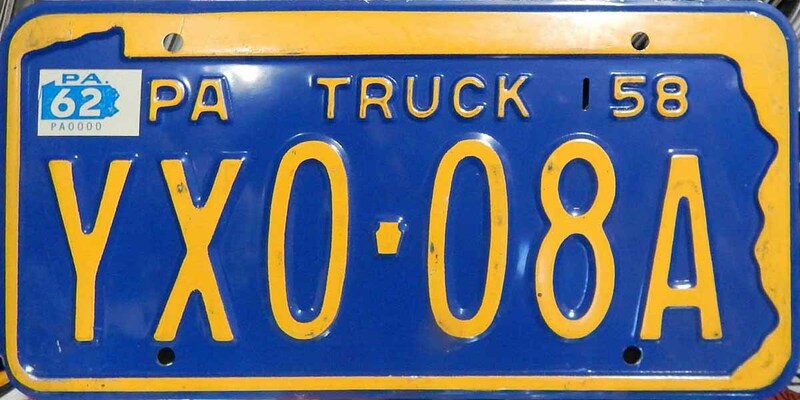 Plates are issued in pairs. 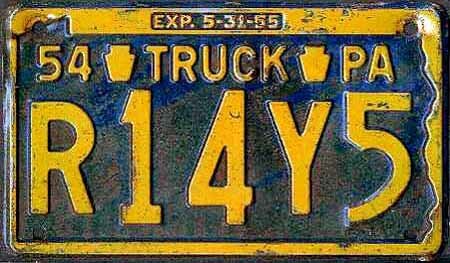 Yellow on dark blue, map outline, top legend 48 then TRUCK flanked by keystones then PA. 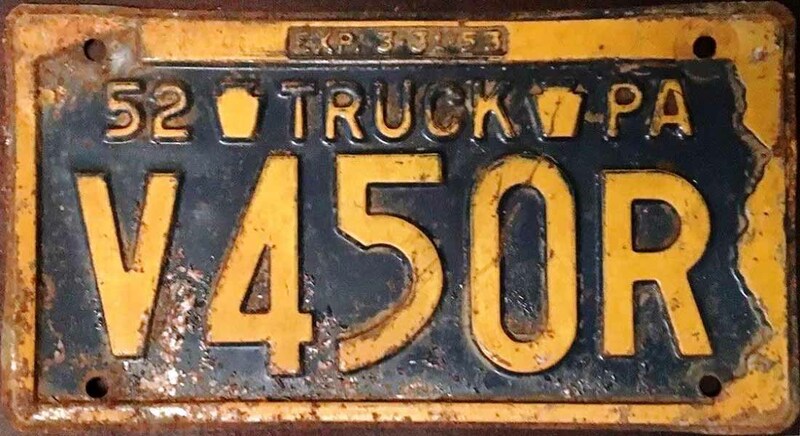 Expiration 3-31-49 in top border. 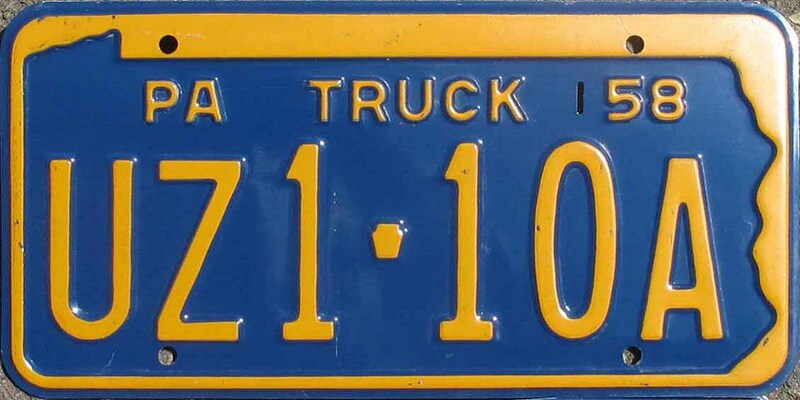 All plates are 5 characters, first letter from R thru Z excluding X, not followed by Z designates the weight classis for a 2-axle truck; first letter from R thru Z excluding X, followed by Z designates the weight classis for a 3-axle truck, remaining 3 characters will include an additional letter in the final position. 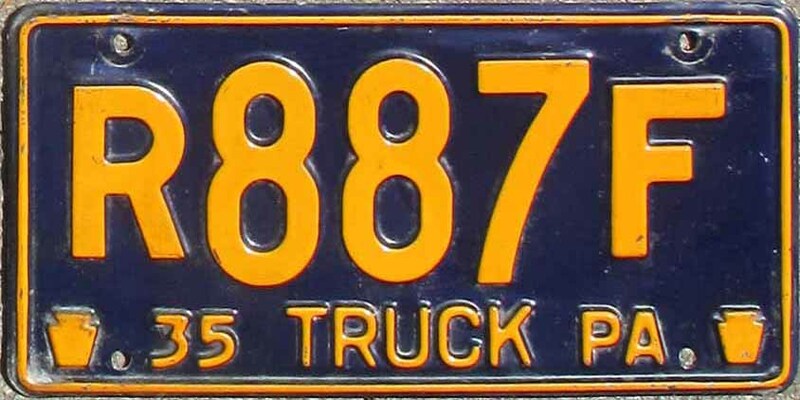 Plate measures 6" x 11", and are issued in pairs. 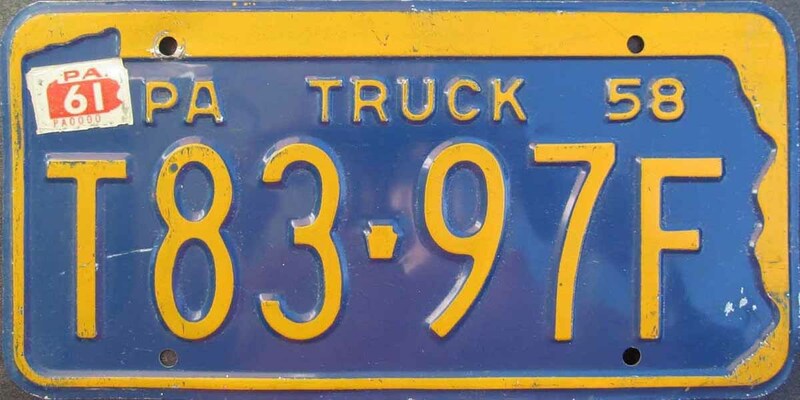 Dark blue on yellow, map outline with EXP. 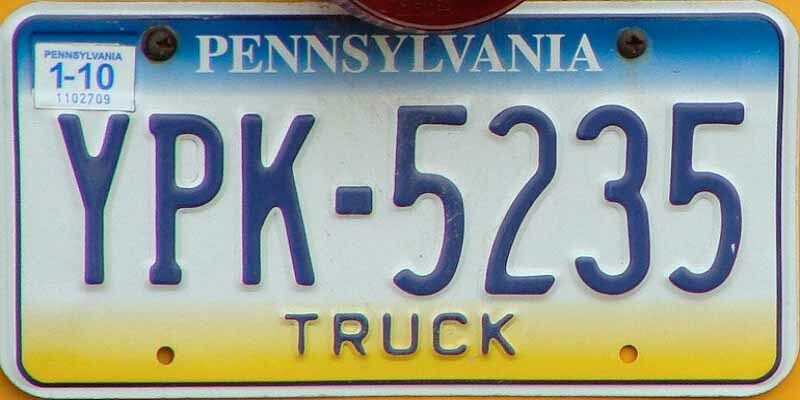 3-31-50 in top border, legend 49 then TRUCK flanked by keystones then PA. All plates are 5 characters, first letter from R thru Z excluding X, not followed by Z designates the weight classis for a 2-axle truck; first letter from R thru Z excluding X, followed by Z designates the weight classis for a 3-axle truck, remaining 3 characters will include an additional letter in the final position. Plate measures 6" x 11". 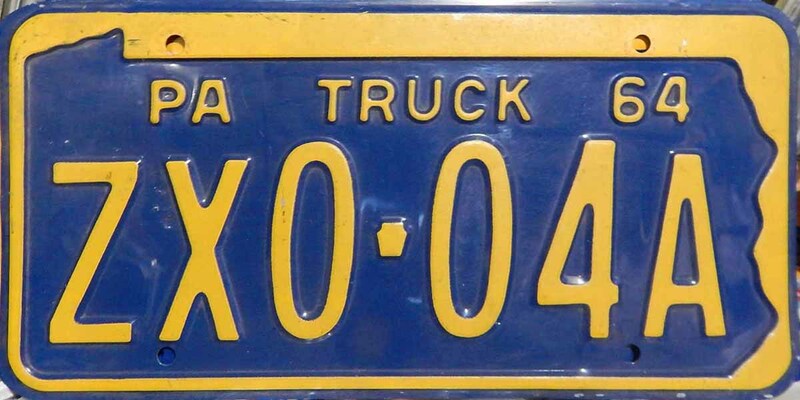 Plates are issued in pairs. Yellow on dark blue, map outline, top legend 50 then TRUCK flanked by keystones then PA. 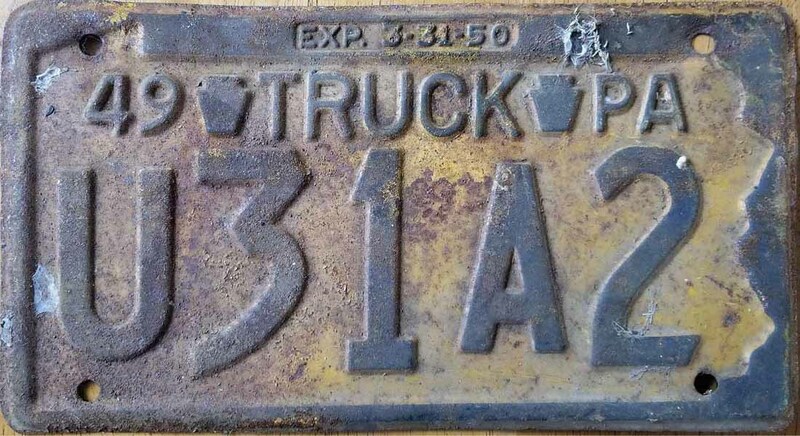 Expiration 3-31-51 in top border. 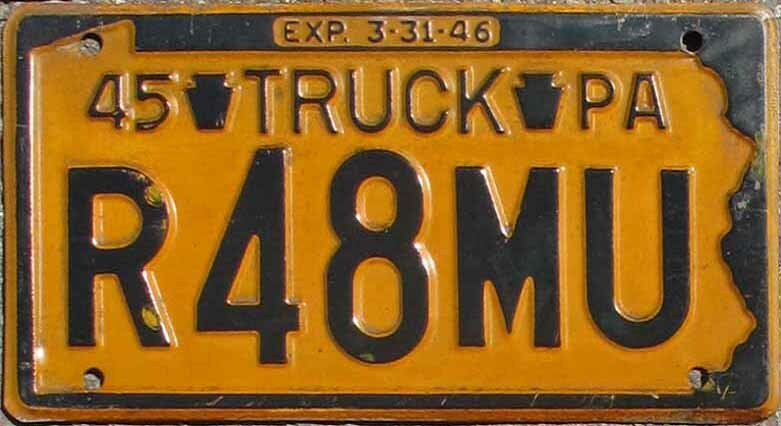 All plates are 5 characters, first letter from R thru Z excluding X, not followed by Z designates the weight classis for a 2-axle truck; first letter from R thru Z excluding X, followed by Z designates the weight classis for a 3-axle truck, remaining 3 characters will include an additional letter in the final position. 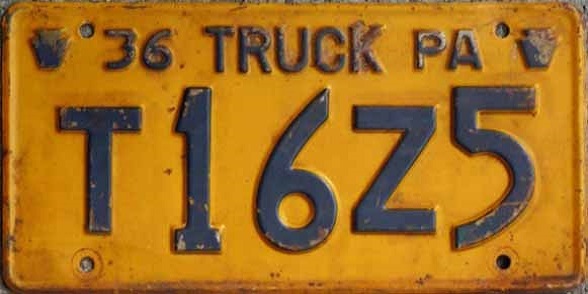 Plate measures 6" x 11", and are issued in pairs. Dark blue on yellow, map outline, top legend 51 then TRUCK flanked by keystones then PA. 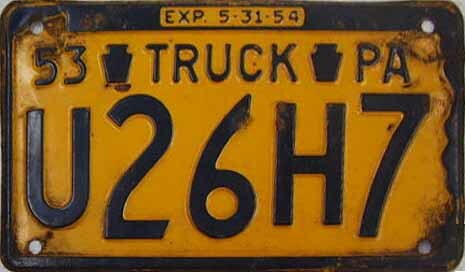 Expiration 3-31-52 in top border. 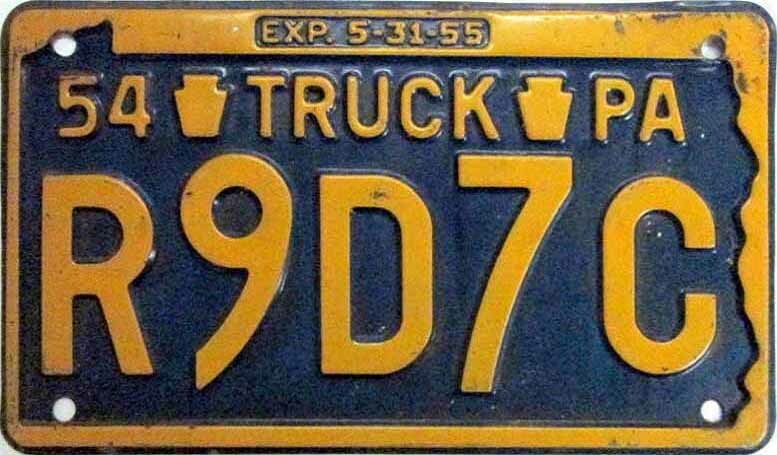 All plates are 5 characters, first letter from R thru Z excluding X, not followed by Z designates the weight classis for a 2-axle truck; first letter from R thru Z excluding X, followed by Z designates the weight classis for a 3-axle truck, remaining 3 characters will include an additional letter in the final position. Plate measures 6" x 11". 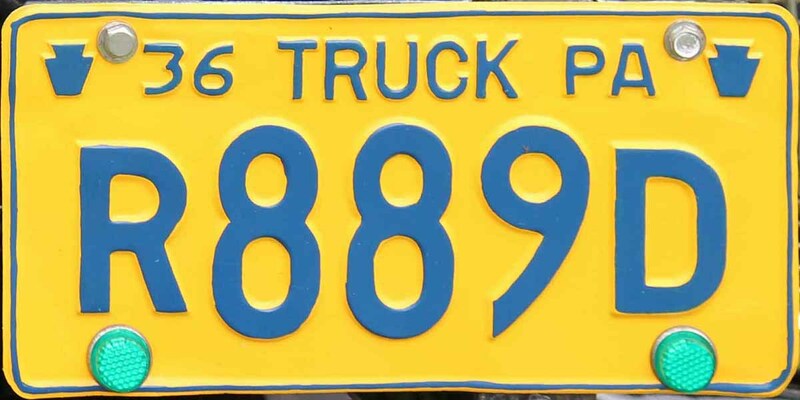 Plates are issued in pairs. Yellow on dark blue, map outline, top legend 52 then TRUCK flanked by keystones then PA. 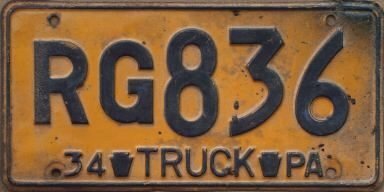 Expiration 3-31-53 in top border. 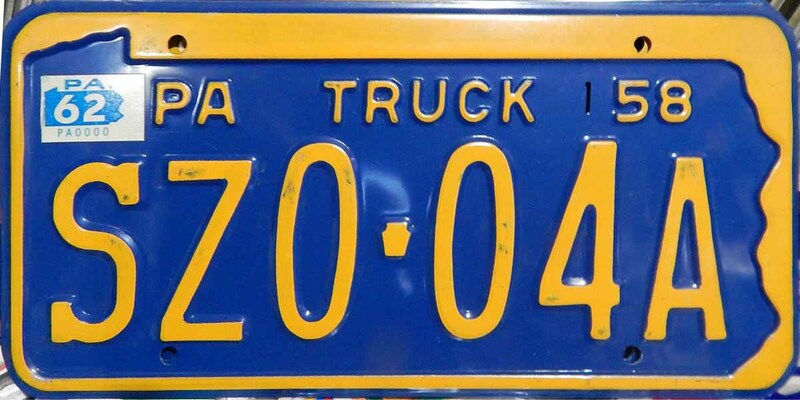 All plates are 5 characters, first letter from R thru Z excluding X, not followed by Z designates the weight classis for a 2-axle truck; first letter from R thru Z excluding X, followed by Z designates the weight classis for a 3-axle truck, remaining 3 characters will include an additional letter in the final position. Plate measures 6" x 11". 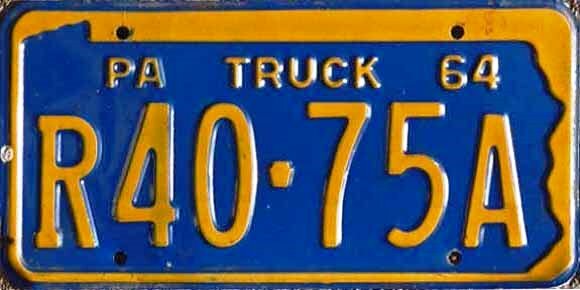 Plates issued as singles. Bottom plate is a test / sample. 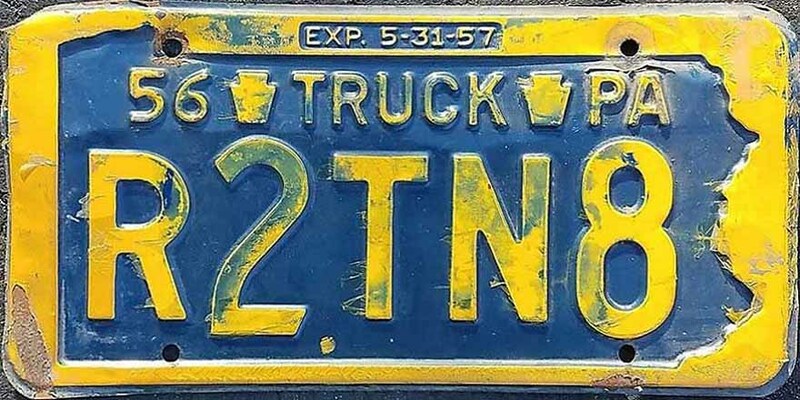 Dark blue on yellow, map outline, top legend 53 then TRUCK flanked by keystones then PA. 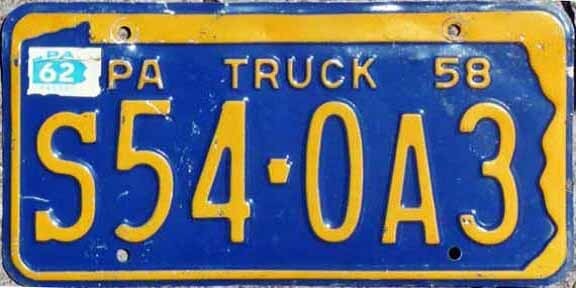 Expiration 5-31-54 in top border. 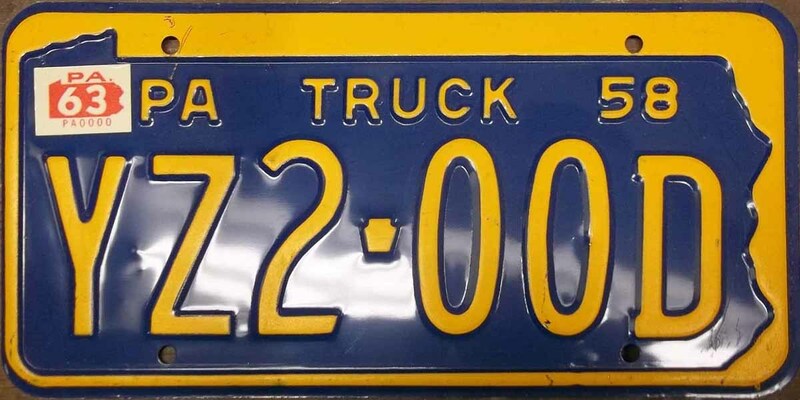 All plates are 5 characters, first letter from R thru Z excluding X, not followed by Z designates the weight classis for a 2-axle truck; first letter from R thru Z excluding X, followed by Z designates the weight classis for a 3-axle truck, remaining 3 characters will include an additional letter in the final position. Plate measures 6" x 10¼". 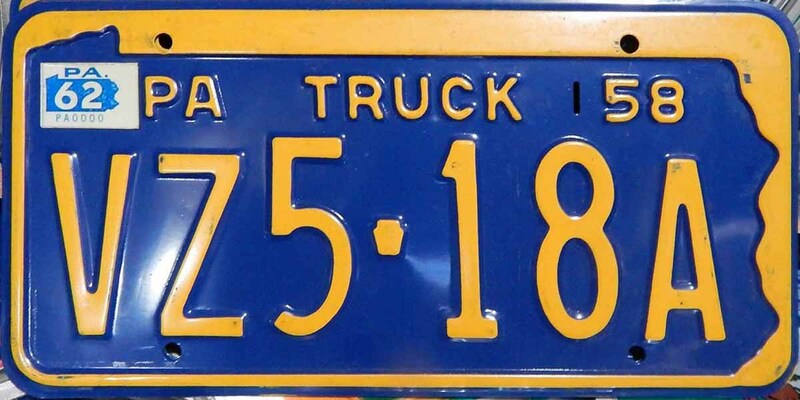 Plates are issued as singles. Yellow on dark blue, map outline, legend 54 then TRUCK flanked by keystones then PA. 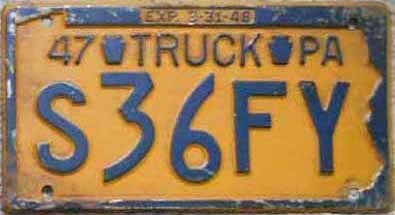 Expiration 5-31-55 in top border. 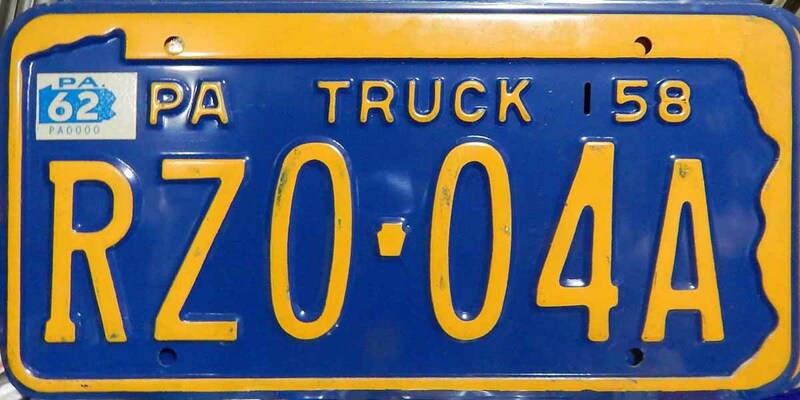 All plates are 5 characters, first letter from R thru Z excluding X, not followed by Z designates the weight classis for a 2-axle truck; first letter from R thru Z excluding X, followed by Z designates the weight classis for a 3-axle truck, remaining 3 or 4 characters will include an additional letter, sometimes 2 letters. Plate measures 6" x 10¼". 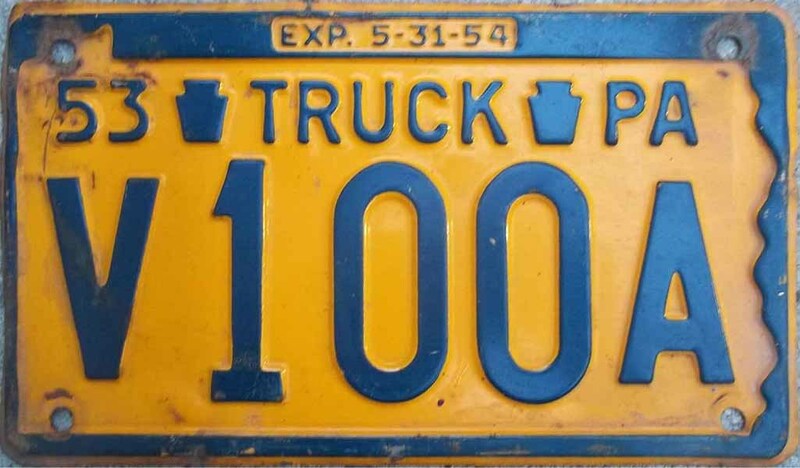 Plates are issued as singles. 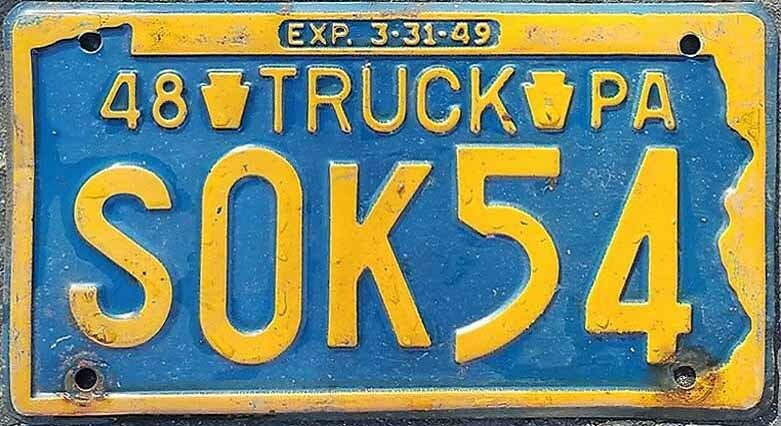 Dark blue on yellow, map outline, legend 55 then TRUCK flanked by keystones then PA. 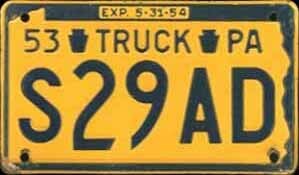 Expiration 5-31-56 in top border. 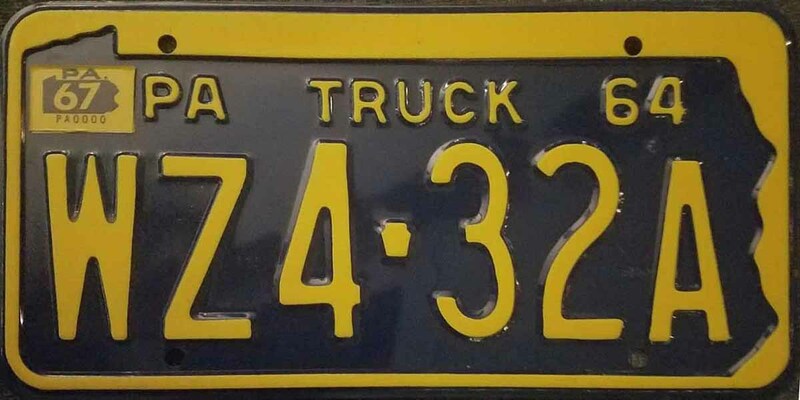 All plates are 5 characters, first letter from R thru Z excluding X, not followed by Z designates the weight classis for a 2-axle truck; first letter from R thru Z excluding X, followed by Z designates the weight classis for a 3-axle truck, remaining 3 or 4 characters will include an additional letter, sometimes 2 letters. Plate measures 6" x 10¼". 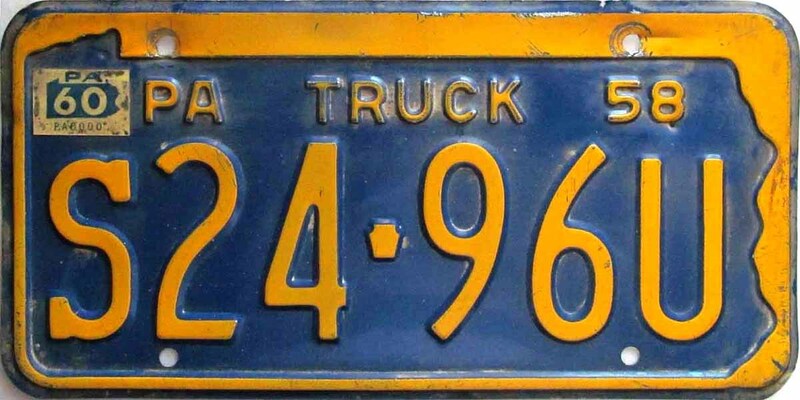 Plates are issued as singles. Yellow on dark blue, map outline, legend 56 then TRUCK flanked by keystones then PA. 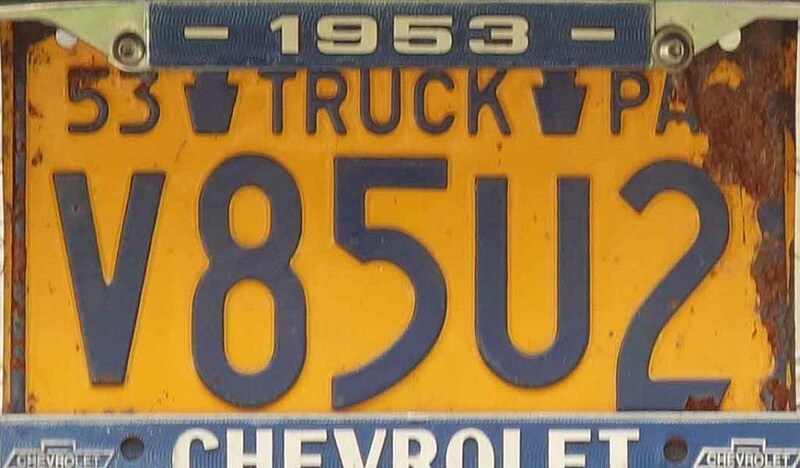 Expiration 5-31-57 in top border. 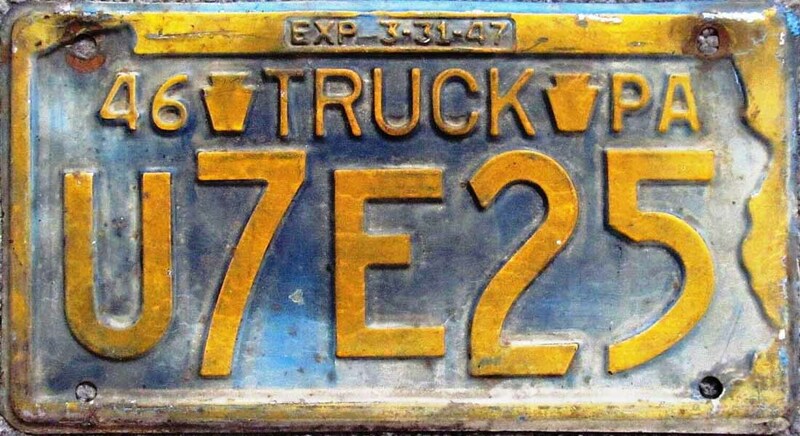 Most plates are 5 characters; however, the R class went to 6 characters, first letter from R thru Z excluding X, not followed by Z designates the weight classis for a 2-axle truck; first letter from R thru Z excluding X, followed by Z designates the weight classis for a 3-axle truck, remaining 3 or 4 characters will include an additional letter, sometimes 2 letters. Plate are now standardized at 6" x 12". 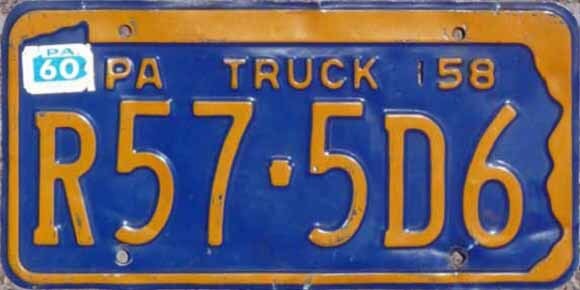 Some plates use the thinner '57 dies, and a base with a narrower map outline. 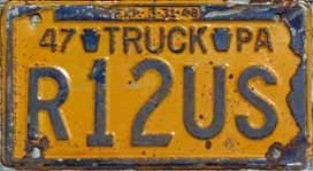 Plates are issued as singles. 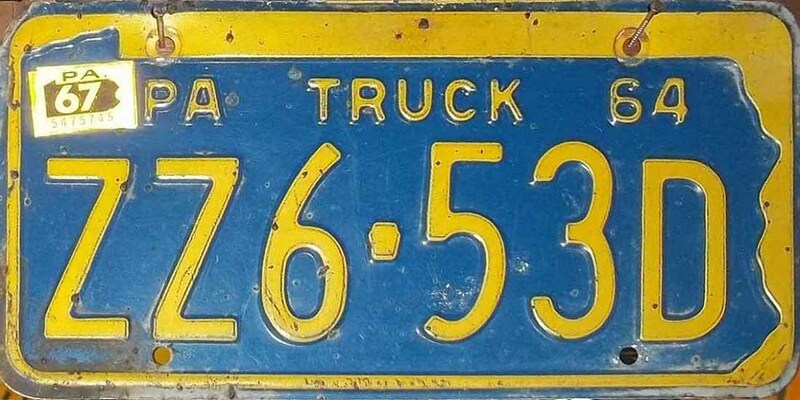 *Image(s) of '56 truck plates w/'57 dies needed, and 6-character truck plates needed. 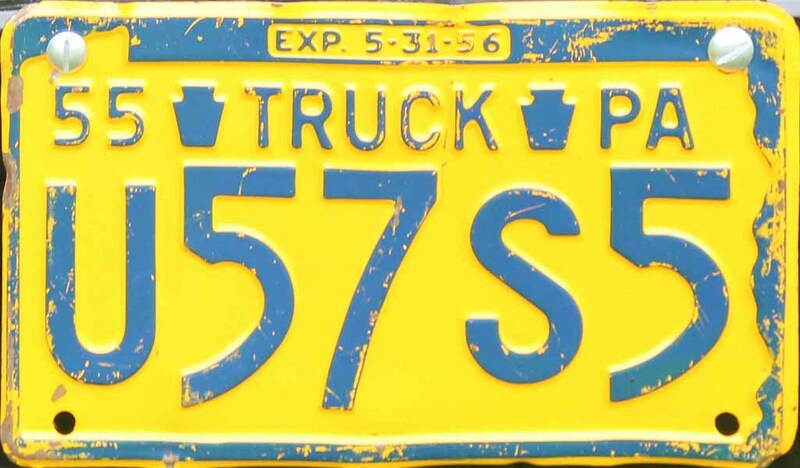 Dark blue on yellow, map outline, legend 57 then TRUCK flanked by keystones then PA. 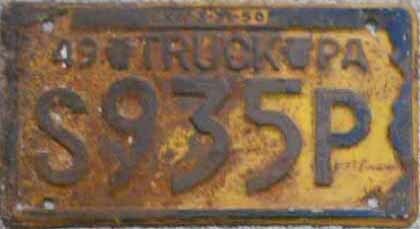 Expiration 5-31-58 in top border. 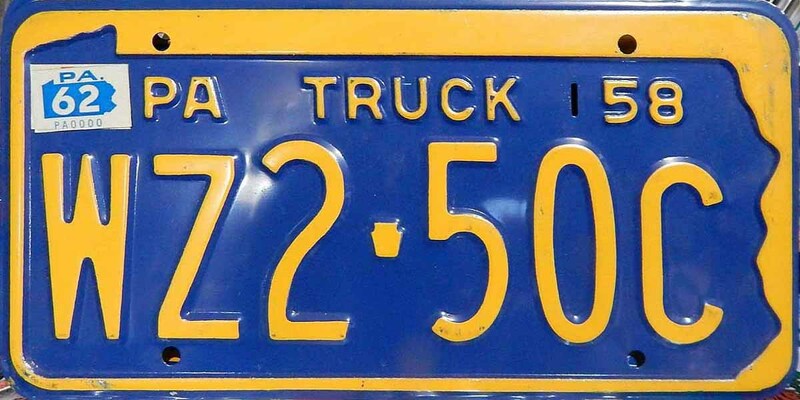 All plates are 6 characters; however, first letter from R thru Z excluding X, not followed by Z designates the weight classis for a 2-axle truck; first letter from R thru Z excluding X, followed by Z designates the weight classis for a 3-axle truck, remaining characters will include an additional letter. Plate measures 6" x 12". 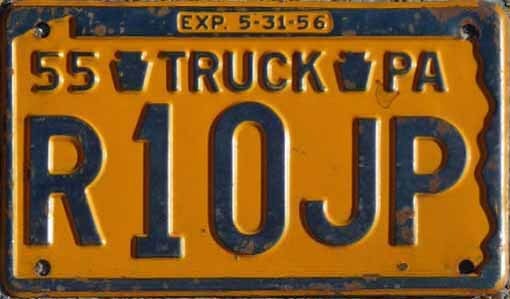 Plates are issued as singles. 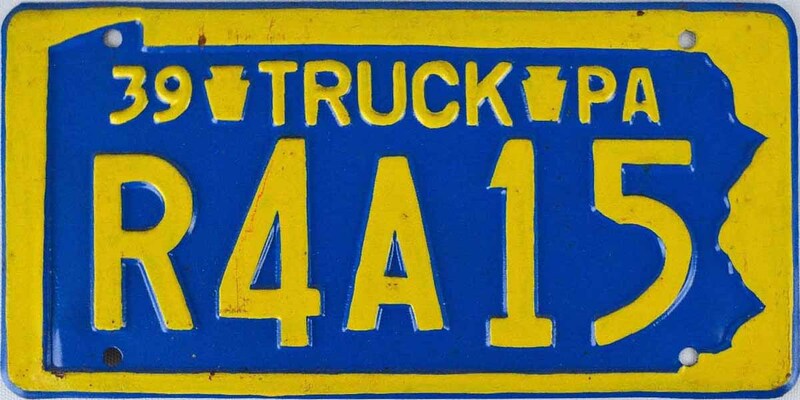 Yellow on dark blue, map outline, legend PA then TRUCK then 64, small keystone separator between the 3rd and 4th digit. 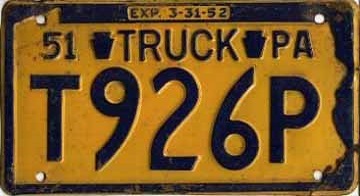 Annual validation sticker was issued for the upper left corner. Plates measure 6" x 12". Weight classes R, S, T, U, V, W, Y, Z, UZ, VZ, WZ, YX, ZZ, WT, YT, ZT, YX, ZX. 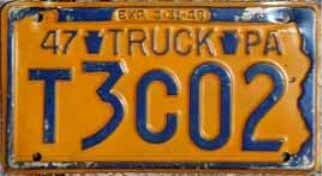 The WT, YT, ZT classes are for 3-axle truck tractors. The progression within weight classes R00-00A, R00-0A0, R00-A00. 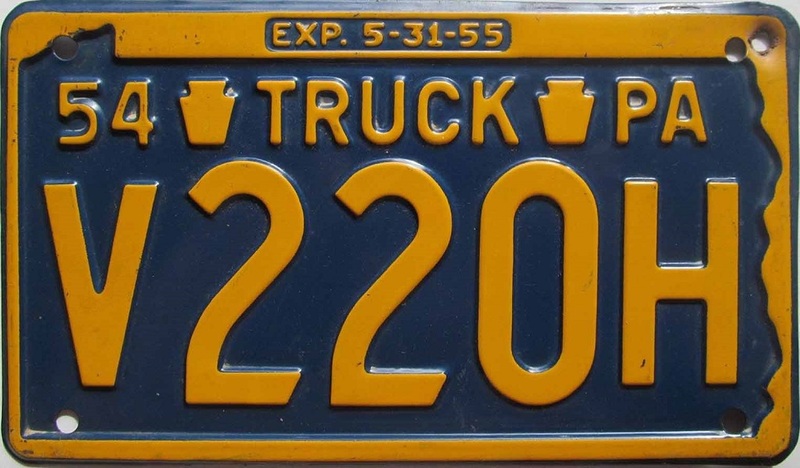 Dark blue on yellow, revised map outline, top legend COMMERCIAL (replacing TRUCK), bottom PENNSYLVANIA, embossed outline for sticker well lower left. 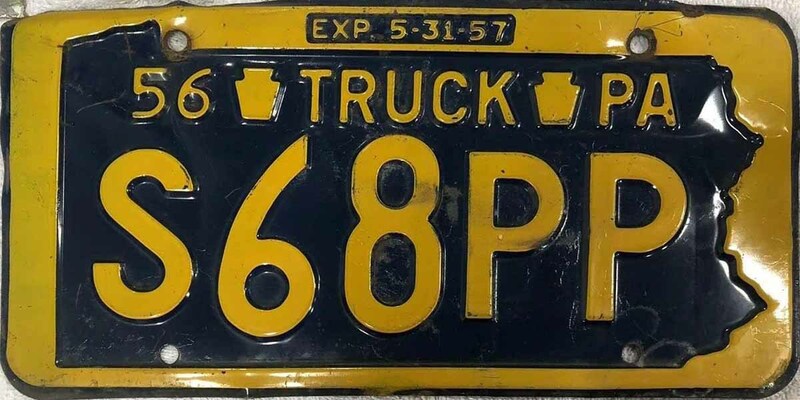 Early plates had 68 etched into the sticker well with no sticker used in 68. 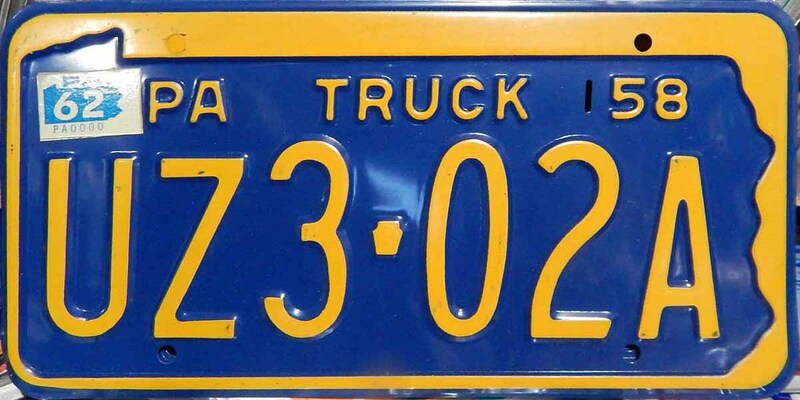 A new plate serial coding system was introduced using CA-10000 as the starting point with C as a non-advancing character and the second letter always advancing last after the numbers. 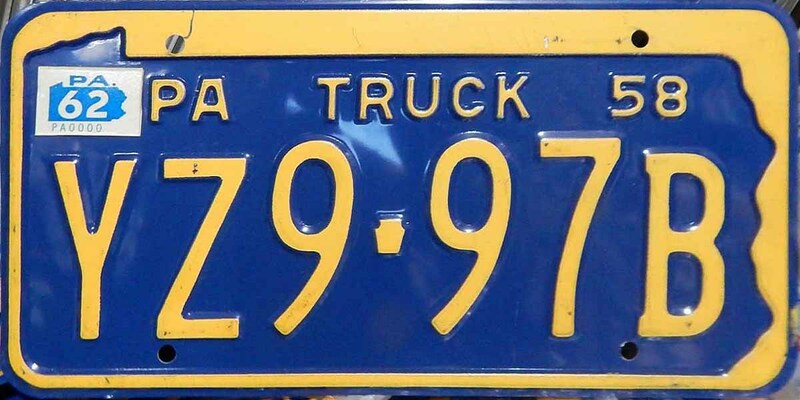 Plates authorized CA-10000 to CZ-99999. 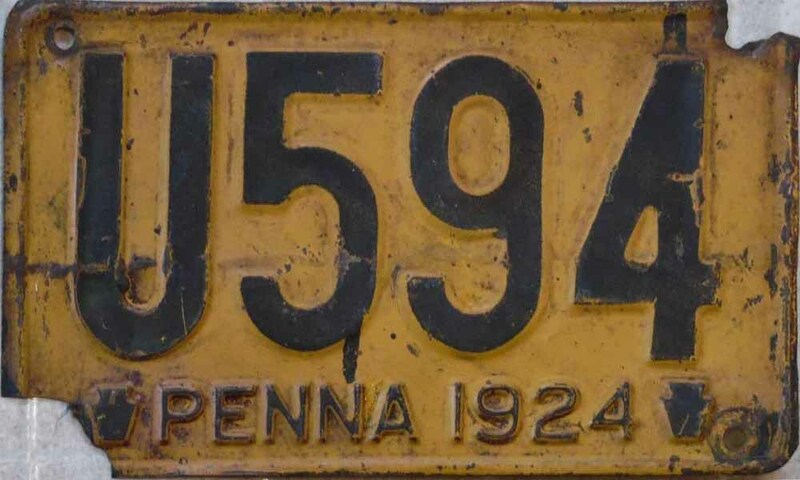 A small keystone separator was used between the 2-letter prefix and the 5-digit number. 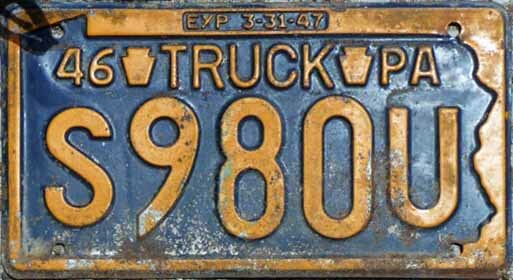 The weight class, number of axles and truck type, although they are still used, are no longer designated by the registration number. 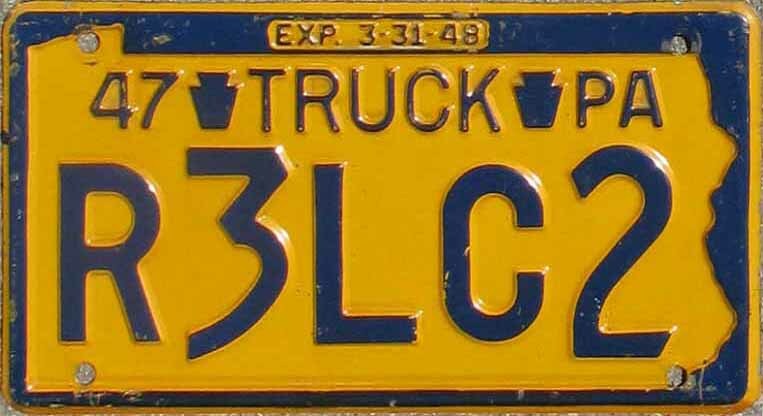 Both the CC-39980 and CL-89915 plates are formatted similarly. 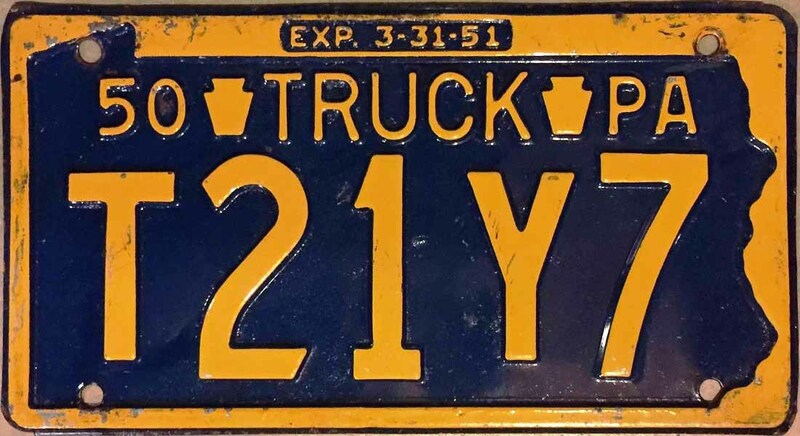 Yellow on dark blue, the map outline has been replaced by a narrow embossed border, top legend COMMERCIAL, bottom legend PENNSYLVANIA, sticker wells upper left and right corners. Serial coding again using CA-10000 as the starting point with C as a non-advancing character and the second letter always advancing last after the numbers. 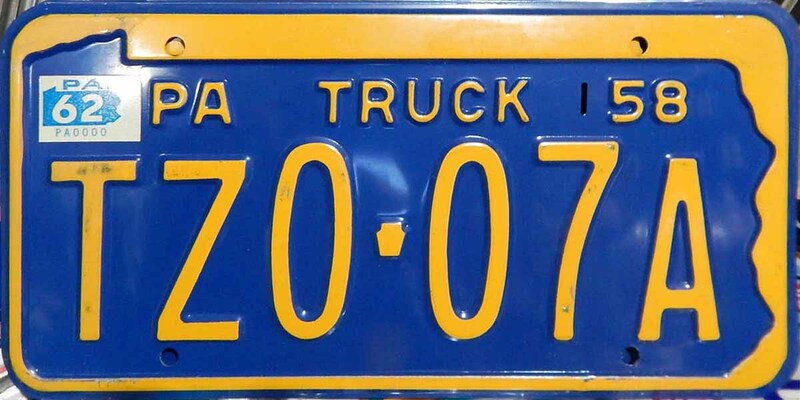 Plates authorized CA-10000 to CZ-99999. 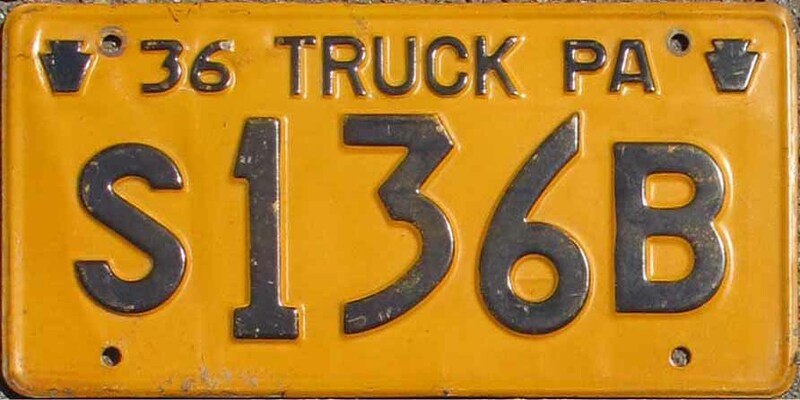 A small keystone separator was used between the 2-letter prefix and the 5-digit number. 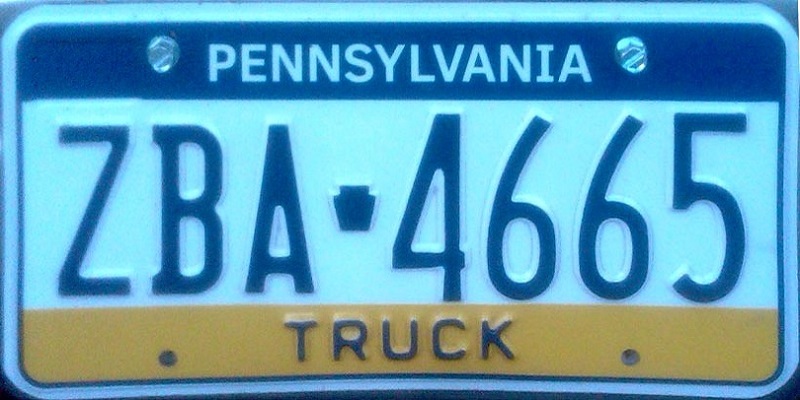 Both the CC-76348 and CT-8531 plates are formatted similarly. 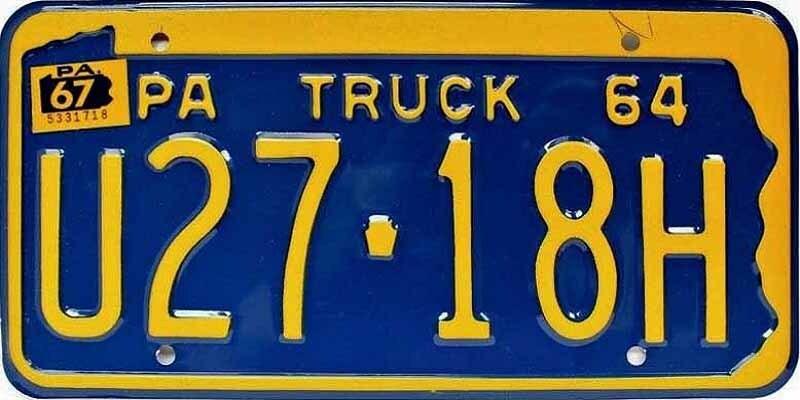 All new plates issued. 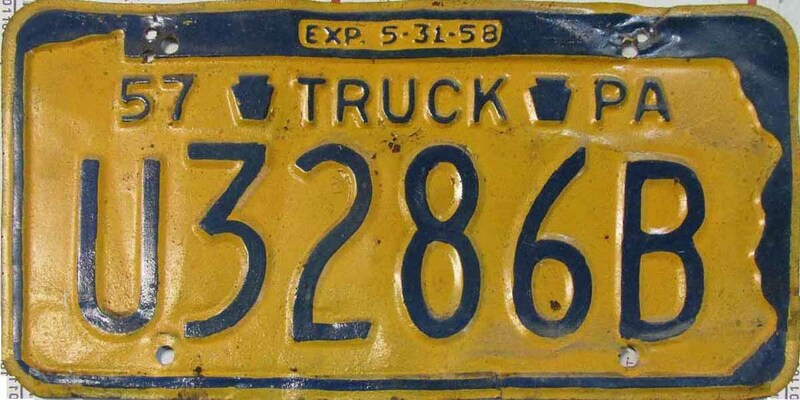 Dark blue on yellow, top legend PENNSYLVANIA, bottom TRUCK, sticker wells upper left and right corners. Serial coding again using CA-10000 as the starting point with C as a non-advancing character and the second letter always advancing last after the numbers. After reaching CZ-99999, the series went to 10000-CA and progressed into the CC series. 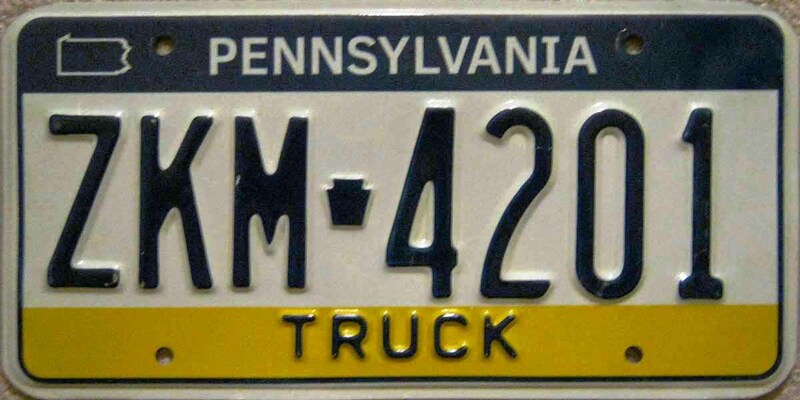 Yellow on dark blue, top legend TRUCK, bottom PENNSYLVANIA, sticker well in lower left corner. Serial coding starting 5 digits+CD as a continuation of 1978 to 1984 progression and ran into the CJ series where it was stopped and a new series starting at YA-00000, then ZA-00000. 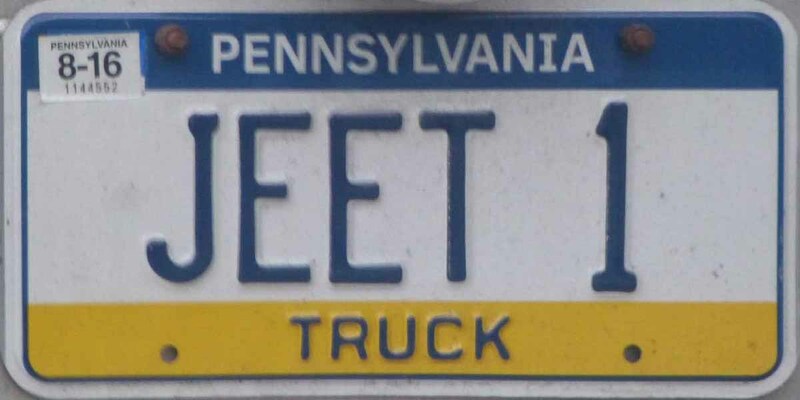 As best as I can remember, PennDOT claimed there was a computer issue with too many registrations starting with C.
Format 1 CD etc. 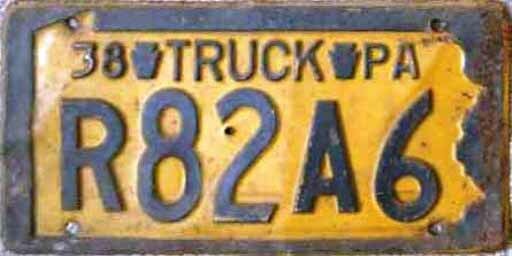 in suffix position as continuation of 1978 to 1984 progression to CJ in suffix position. 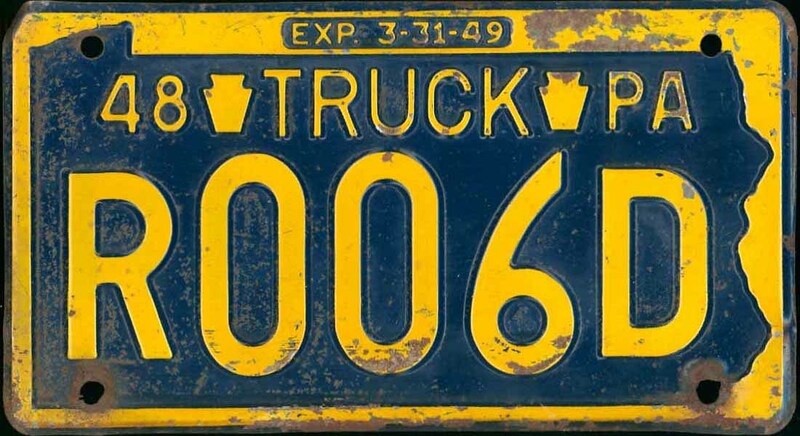 Dark blue on white with fading bands of blue on top and yellow on bottom, YAA-0000 to YRR-9810 or above, dash separator, PENNSYLVANIA screened across top and TRUCK embossed along bottom. Sticker well upper left. 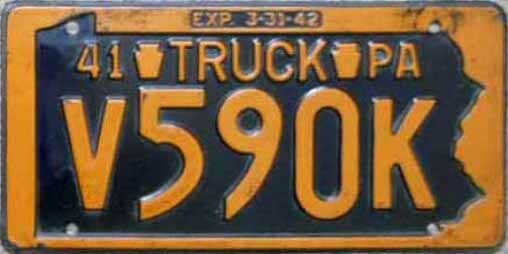 Plates valid thru 2017 and likely beyond. 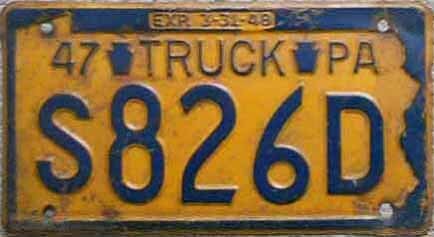 Vanity plates on trucks appear to be issued on the passenger www base, and have limited weight restrictions. 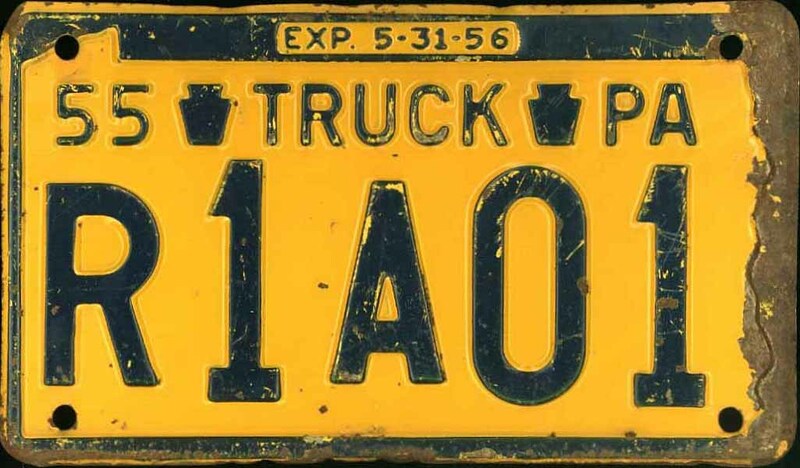 Dark blue on white with solid bands of blue on top and yellow on bottom, YSA-0000 to YZZ-9999, then ZBA-0000 to ZKH-9999, keystone separator, PENNSYLVANIA screened across top and TRUCK embossed across bottom. Sticker well upper left. 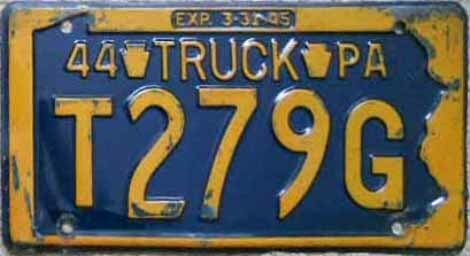 Plates valid thru 2017 and likely beyond. 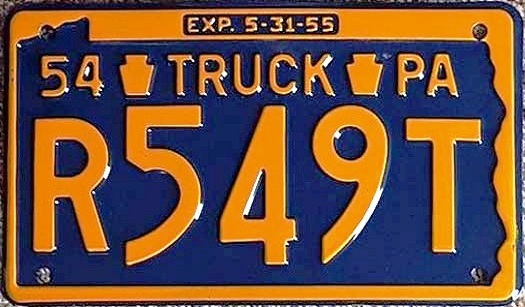 Plates are referred to by many as visitPA plates or solid band plates. 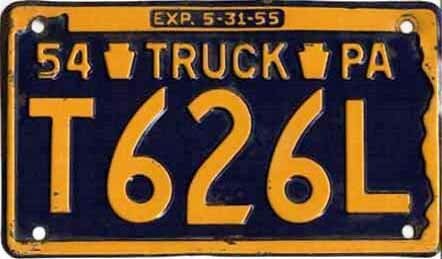 PennDOT uses the term Family of Plates. 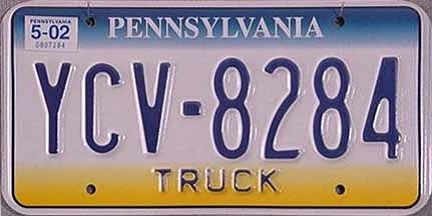 Vanity plates on trucks appear to be issued on the passenger visitPA base, and have weight restrictions not exceeding 14,000 pounds. 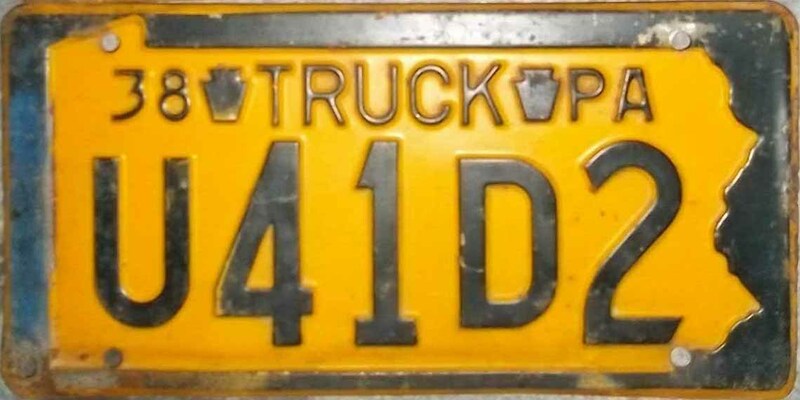 The plate to the right is the only vanity spotted with Truck as the legend. Information subject to verification. 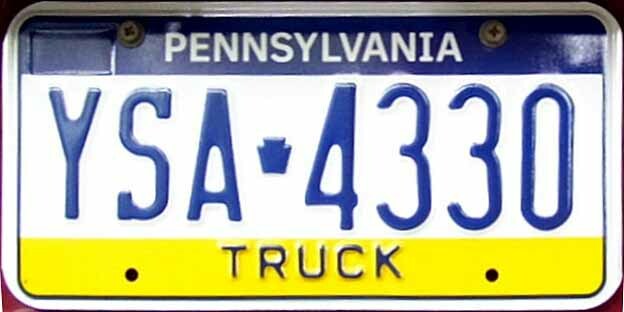 In December of 2016 PennDOT announced that by the middle of 2017, once the supply of the current plate stock runs out, they will begin issuing slightly redesigned plates. 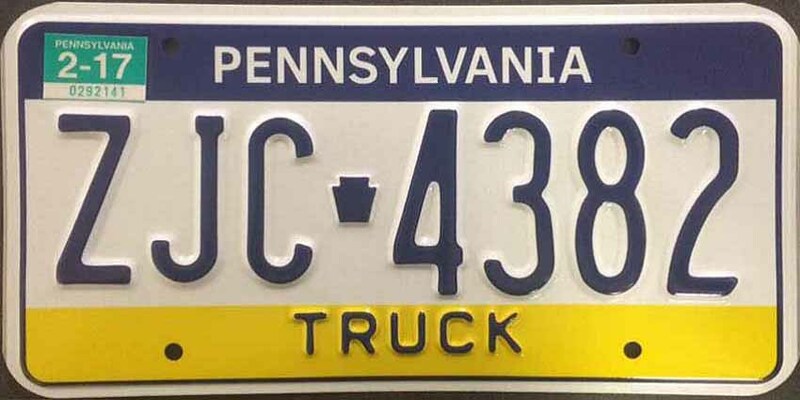 They look similar in design to the current plate but the sticker well where validation stickers were placed has been removed and the outline of a small Pennsylvania map has been put it its place. 2017 is a mixture of both variants. 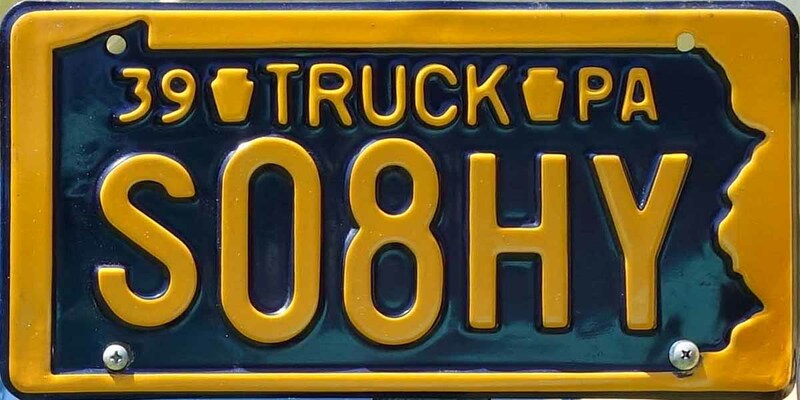 There is no prototype image of the Truck plate. 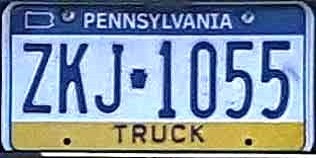 Format 1 - up to ZKH-9999, same as older Truck plates on visitPA base, with sticker well, no sticker, no map. The ZKI prefix was not used. 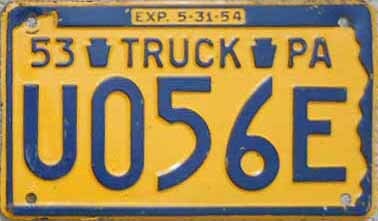 Note: Plates without the sticker well and without the map outline are not known to exist. 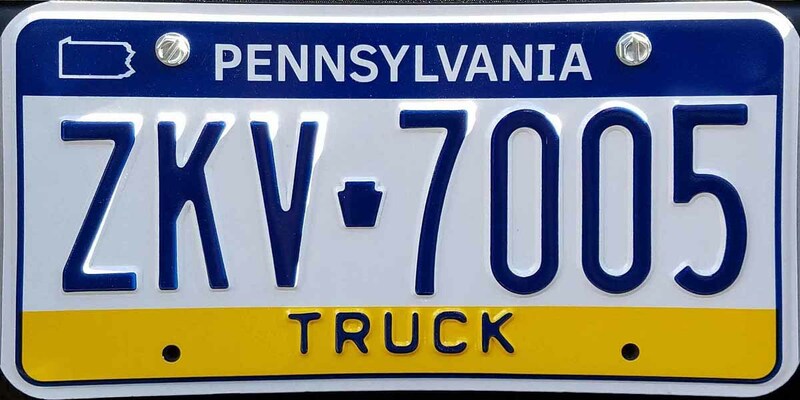 Format 2 - ZKJ-0000 to current high, similar to Format 1 Truck plates on visitPA base but now without sticker well, and with a small map outline in its place. 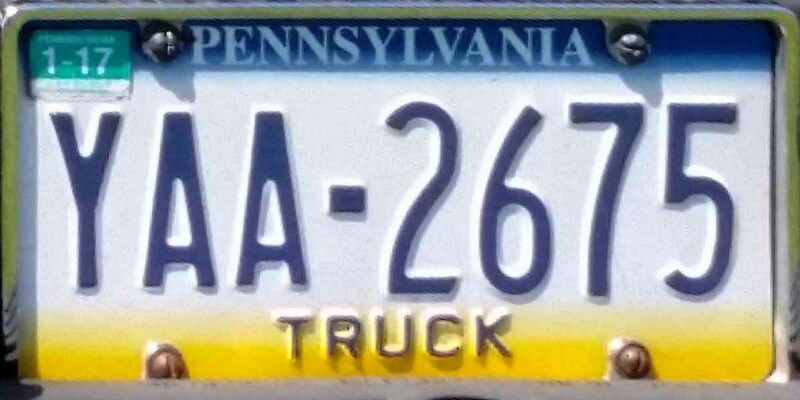 Plates first seen in mid-May of 2017.